• Will ranching continue to be associated with deforestation in the Amazon? Every day, ranchers in the Amazon receive a message from the market: I’ll buy your cattle. The messengers of the market who arrive by rivers and roads, are middlemen traders and employees of meat-packing plants who transport the cattle using trucks and barges for up to hundreds of kilometers to the slaughter site. From the meat-packing plants, meat and offal go to various clients such as local butchers, major supermarket chains in large Brazilian and international cities and restaurant chains. The leather goes to tanneries and after processing is turned into shoes, purses, car seats and other in Brazil and overseas. About 23% of Brazilian beef production is exported, and the rest supplies the domestic market (IFNP, 2016). Responding to market appetite, local ranchers and new migrants to the Amazon deforested more areas in order to plant pastures. As a result, the herd in the Brazilian Amazon grew from 37 million head (23% of the national herd) in 1995 para 85 million in 2016, or almost 40% of the national herd. Thus, in 2016, there were approximately four head of cattle per inhabitant in the region. The growth of ranching in the Brazilian Amazon is also supported by public policies such as rural credit and sanitary surveillance, and in 2006 involved approximately 393 thousand ranches, according to more recent data from the IBGE (IBGE – Censo Agropecuário, 2006; Rivero et al., 2009). However, ranching has increasingly been seen as a major environmental threat, especially because of its associated deforestation, the great majority of which is illegal. Around 65% of the area deforested in the Amazon was occupied by pastures in 2013-2014 (Inpe/Embrapa, 2015 and Inpe/ Embrapa, 2016). The burnings used to clear the land after deforestation account for about 37% of the countries greenhouse gases that cause global warming (SEEG, 2016). Besides affecting the climate, this pollution causes premature deaths due to respiratory diseases in the region, in the rest of the country and in South America, where the smoke spreads; and causes premature births and the birth of babies below normal weight (Bermúdez et al., 2014). Furthermore, ranching is the leading activity in cases of work analogous to slavery (CPT, 2016) and is strongly associated with land-grabbing, meaning the illegal occupation of public lands (See example in MPF-PA, 2016). In order to combat the negative aspects of ranching in the Amazon, in 2009 environmental non-governmental organizations (NGOs) carried out campaigns and attorneys for the Federal Public Prosecution Service (MPF) and the Brazilian Institute for the Environment and Renewable Natural Resources (Ibama) in Pará conducted legal procedures against ranches, meat-packing plants, supermarkets, tanneries, retailers (supermarkets) and industry (Greenpeace, 2009; MPF, 2009; Smeraldi & May, 2009). The action by the MPF was based on a law that requires accountability from a company that buys products derived from environmental crimes and on the fact that the government had begun disseminating a list with areas embargoed due to illegal deforestation (MPF, 2013). In response to those actions, several companies immediately stopped buying meat from 11 meat-packing companies in Pará. To regain the market and rid themselves of lawsuits, several meat-packing companies have signed agreements that seek to reduce deforestation, promote regeneration of illegally deforested areas and curb slave labor. 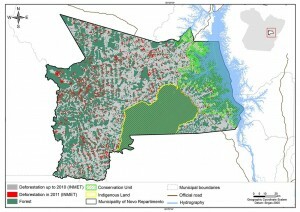 They have committed to boycotting cattle coming from areas with at least one of the following problems: deforested after October 2009, embargoed by Ibama, convicted of the occurrence of labor analogous to slavery as found on the Ministry of Labor list, overlapping protected areas (Conservation Units and Indigenous Lands), not registered in Rural Environmental Registry (CAR) and lacking Animal Transport Permits (GTA) (Barreto and Araújo, 2012; Gibbs et al., 2015). Additionally, the meat-packing companies were given a deadline for developing mechanisms to also monitor their indirect suppliers and guarantee that those properties had also not deforested after October 2009 (Greenpeace, n.d.). The indirect suppliers are ranches who produce calves and bullocks and later sell them to the fattening ranches from who the meat-packers purchase the fattened cattle for slaughter. Compliance with the agreements was to be evaluated through independent audits. 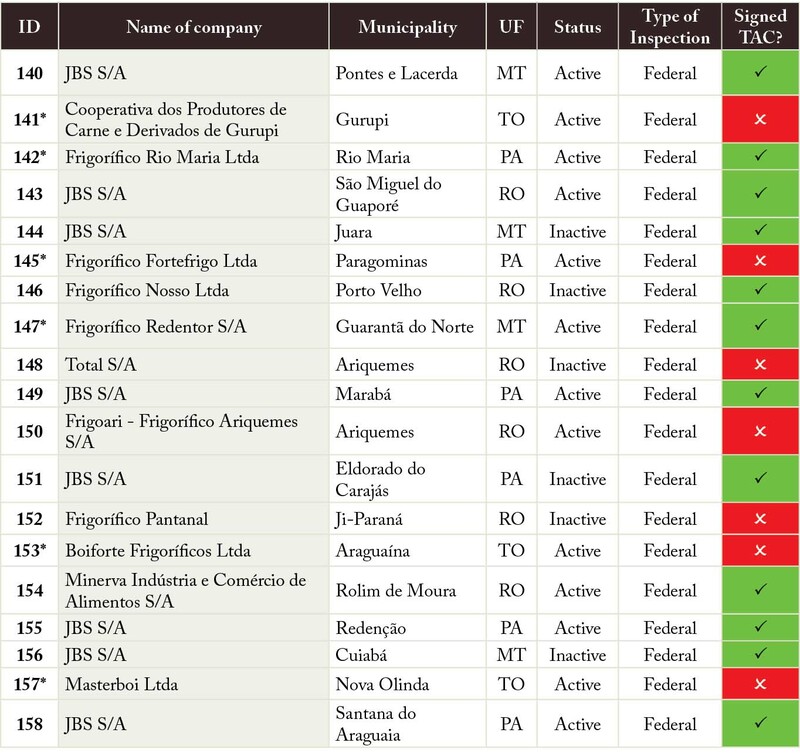 After the agreements in Pará, meat-packing companies in other states also signed TACs (MPF, 2013). Other repercussions occurred after the first agreements. In 2009, the National Bank for Economic and Social Development (BNDES) issued guidelines for financing meat-packing companies, in which it promised to demand that by December 2015 all cattle supplying the companies financed would be tracked from birth to slaughter (BNDES, 2009). The Brazilian Supermarket Association (Abras) also promised to launch a system for certifying the origin of beef so as so avoid purchases of beef from deforested areas in the Amazon and associated with other environmental and social irregularities (Inacio and Froufe, 2009; Abras, 2013). Furthermore, in 2016, after the campaign disseminated in the Greenpeace report “Carne ao Molho Madeira,” which mobilized consumers, three large supermarket chains (Walmart, Pão de Açúcar and Carrefour) committed to monitoring their direct suppliers (meat-packing companies) and developing tools to avoid purchases from areas with recent deforestation and the occurrence of work analogous to slavery. These agreements generated great expectations due to their innovative nature and the fact that Brazil is the largest deforested on the planet (Greenpeace, 2016b). However, the agreements have not been enough to reduce deforestation in the Amazon in a sustained manner. The annual deforestation rates fell from 2010 to 2012 (7 thousand to 4.5 thousand square kilometers), but have risen since 2013, reaching 8 thousand square kilometers in 2016 (Inpe, 2016), a period when more companies had signed the agreements. Meanwhile, the cattle herd slaughtering in the region are continuing to rise, according to data from IBGE (2017 to 2017a) and Pnefa (2016) (Figure 1). Slaughtering only fell in 2015 because of the economic recession in Brazil (Azevedo and Portugal, 2016). Therefore, companies involved with ranching in the Amazon (producers, processers, buyers, guarantors) continue running risks (direct and indirect) of lawsuits, loss of their reputations due to environmental campaigns and loss of markets. Where are the meat-packing companies (owners of the meat-packing plants), whether signatories or non-signatories of TAC in the Brazilian Amazon and what are their characteristics? 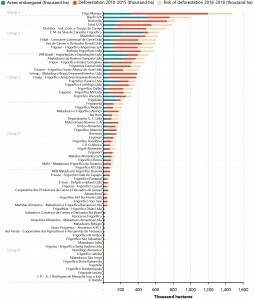 Where does each meat-packer (packing plant) probably purchase cattle (potential cattle purchase zone) and what are the risks associated with deforestation in those zones considering the areas embargoed by Ibama due to deforestation, deforestation from 2010-2015 and the risk of future deforestation (2016-2018)? Which meat-packing companies are more exposed to the risks associated with deforestation? Why does deforestation persist despite the agreements? Will deforestation for ranching continue, given the current forces and tendencies for and against deforestation? Our analysis was able to deal with most of the meat-processing industry, because we mapped the meat-packing plants responsible for 93% of slaughter in 2016, according to IBGE (2017a). These are the meat-packing plants registered with the State Inspection Systems (SIE), which can sell only in the states where they are located, and in the Federal Inspection System (SIF), who may sell throughout the country and even export, if they meet additional criteria. We did not map the meat-packing plants and slaughterhouses registered with these Municipal Inspection Systems (SIM), which can sell only in the municipalities where they are registered. Although in larger number, the companies registered with SIM account for only 7% of slaughter activity according to IBGE (2017a) and their data are harder to found, since they are not systematically made publicly available. There are also clandestine slaughterhouses that are not registered with any sanitary inspection system, which accounted for less than 10% of slaughters in 2012 according to Cepea (Cepea, 2014). As we will show later, the purchasing zones analyzed covered almost all of the pasture areas. Thus, the limitations in municipal data did not result in a significant loss for the analysis. The Brazilian Amazon (Amazônia Legal) covers the territories of Acre, Amapá, Amazonas, Mato Grosso, Pará, Rondônia, Roraima and Tocantins and a portion of Maranhão situated West of meridian 44º W. It was defined in 1953 based on its sociopolitical character. For example, the reduction in deforestation from 2001 to 2012 avoided the death of 1,700 persons per year in this region, according to Reddington et al. (2015). We used specific methodologies for each of the three parts of the study, as will be presented below. This estimate required four steps. The first step was to map the meat-packing plants. We obtained their addresses fromdatabases at Mapa (Mapa, 2016) and the state agencies for agricultural and livestock defense in the Brazilian Amazon (Adaf, Adapec, Adepará, Aderr, Aged, Diagro, Idaf, Idaron and Indea). Next, we identified which packing-plants were active and inactive. To do that, we did phone interviews with representatives of the meat-packing plants and agriculture and livestock defense agencies and consulted specialized sites for ranching. Next, we validated the addresses of meat-packing plants using satellite images available on the Google Earth platform. We individually inserted the addresses in the platform, which directed us to the location indicated in the image, where we verified if the image of the site corresponded to the characteristics of a meat-packing plant. That was possible because a packing plant has a standardized structure with corrals tanks for water storage and treatment, as we showed in Figure 2. When the address did not coincide exactly with a packing plant in the satellite image, we manually adjusted the geographical coordinates so that the point was exactly over the plant. The final product of this stage was a table in the Fusion Table App environment and a map with the validated location of the meat-packing plants in the Google Earth program and the ArcGis 10.3 program. The sites consulted were: http://g1.globo.com/mato-grosso/noticia/2015/07/frigorifico-de-matupa-fecha-e-demite-cerca-de-200-funcionarios.html; http://jaruonline.com.br/cinco-frigorificos-de-carne-estao-fechados/; https://www.facebook.com/851300584980716/photos/pcb.854093761368065/854093024701472. Google Earth is a three-dimensional map application managed by Google, that makes it possible to identify crossings, constructions, cities, landscapes and other elements with known characteristics, as well as to visualize addresses, generate maps and access satellite images. The Fusion Table App is a service provided by Google that enables data storage and management. Users can visualize and share the data online, as well as downloading and modifying them. The second step was to obtain data on the maximum distances from the meat-packing plants for purchasing cattle. That was done in phone interviews from March to April 2016, with representatives of 40 plants, or 31% of the active units. For the meat-packing plants we were not able to contact, we estimate a regional average of distances based on the known data from the three closest meat-packing and, when we lacked sufficient information to calculate that average, we estimated a state average according to the type of inspection – meaning, we estimate that those registered with SIF would have a scale of slaughter and distance for purchasing cattle in the same range as those that also have federal registration. The product of this step was a Fusion Table App spreadsheet with the record of the maximum distances for each meat-packing plant. We consider that the data provided by the interviewees refer to the drier period or the year, which is when the meat-packing plants travel greater distances to buy cattle. The exception are the meat-packing plants located in the state do Amazonas, who travel greater distances during the rainy season, when there is a scarcity of animals nearby and they need to use the rivers to buy cattle in more distant regions. Those routes are a network of official and non-official roads and/or navigable rivers. The third step was to was to estimate the potential cattle-buying zones for meat-packing plants, which is the reason where it is feasible for them to purchase the cattle (See an example of a zone in Figure 3). That estimate was carried out in two stages. First, we projected the zones considering the maximum distances for purchase informed by the interviewees and the access routes. Next, when necessary, we adjusted the zones considering factors that restrict or expand the purchasing zones in particular situations. We note that the estimate determines the potential maximum purchase zone and not necessarily the effective purchase zone. The estimate of that zone thus serves to map the potential risk exposure, but does not attribute a precise risk for effective purchases by the companies. We interviewed only representatives of the meat-packing plants who were willing to provide information. In order to project the potential maximum zone ranges for purchasing cattle of each meat-packing plant we used the function of a program (Cost Distance from ArcGis) that makes it possible to identify all and use all of the routes available near the plants until reaching the maximum purchasing distance obtained. To do that, we used the location of the meat-packing plants and considered the following routes: official roads (IBGE, 2012) and non-official roads (Imazon, 2012), navigable rivers (Inpe/Prodes, 2015) and pastures in 2014 in the Amazon biome (Inpe/Embrapa, 2016) and in 2010 for the portion of the Cerrado biome contained in the Brazilian Amazon (Lapig, 2010). See an example of a potential purchasing zone for a packing plant in Figure 4A. 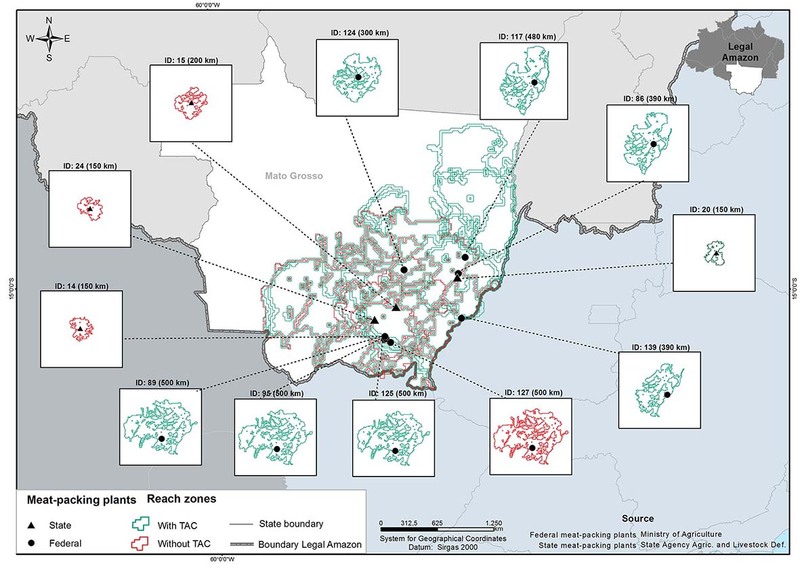 To confirm if the reaches of the potential cattle-purchasing zones generated by ArcGis were plausible, we consulted the literature, key informants (a total of six, including rural producers and veterinarians from the agriculture and ranching defense agencies) and the database of the Ministry of Agriculture, Ranching and Supply (Mapa), who the destinations of animals for from each state. When the information generated by ArcGis and the information supplied by the aforementioned sources did not coincide, we had to exclude or add areas to the zones defined by ArcGis. That adjustment resulted in a 7% cut in the zone initially calculated. The principal adjustments were made in Amazonas, Pará and Amapá. That occurred, for example, when ArcGis recorded the potential purchasing zone of a packing plant or part of it in an area of a neighboring state where the company does not by cattle, according to the bibliography, key informants and/or the database from Mapa consulted. For example, our data sources informed us that it is common for animals to leave Pará and be taken to Tocantins for slaughter, but not the opposite. In those cases, then, we excluded the territory of the neighboring state from the zone (See an illustration of that example in Figure 4B). Another example was when the zone for purchasing cattle of a given meat-packing plant extended to municipalities that were in fact not suppliers, and we had to expand the zone according to information provided by our data sources. Data for non-official roads are only available inside the Amazon biome. For areas outside the biome, but inside the Brazilian Amazon, we used information from official roads, navigable rivers and pasture to define the potential cattle-buying zones. The fourth and last step was to rank the meat-packing companies in terms of exposure to the risk of purchasing cattle produced from deforestation. 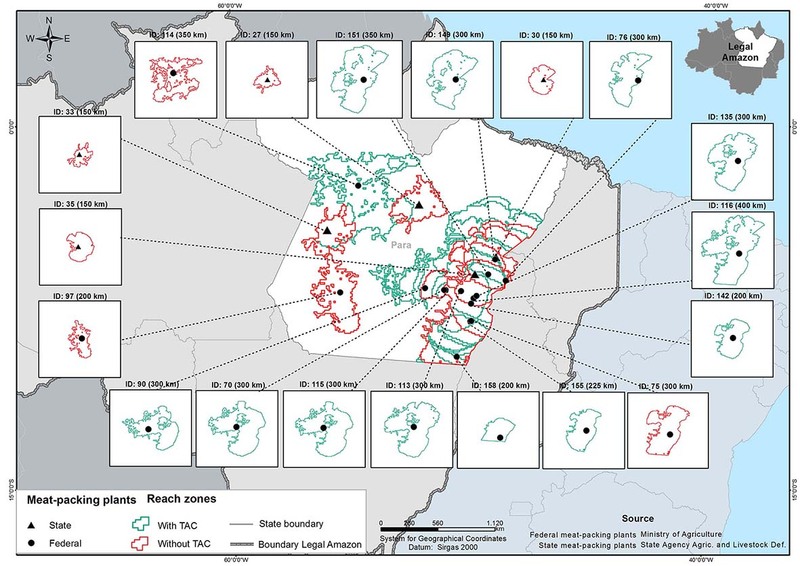 To estimate the exposure of each meat-packing plant we crossed the map of the potential purchasing zone of each of them with the maps of the areas embargoed by Ibama (up to November 2016) with the largest total of areas recently deforested (2014-2015) and at risk of future deforestation (2016-2018). Later we ranked the meat-packing plants according to as the largest sums of those variables. To avoid double counting of deforested areas, we subtracted the areas embargoed from the areas deforested. 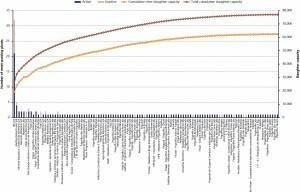 We used the Jenks natural breaks classification method to classify the companies according to internal variance and to enable visualization of different risk groups. In the case of companies that had more than one (meat-packing plants), we totaled the areas of those variables inside the purchasing zones of all of the plants the company had. We used the ArcGis computer program to do the crossing and sum of all the variables. Figure 5 shows an example of crossing the purchasing zone of a packing plant with the indicators evaluated. In a complementary analysis, we overlaid the purchasing zones of meat-packing companies on areas of pastures formed by 2014 in order to estimate the pasture area potentially accessible to each company. To analyze the factors that contribute to the persistence of deforestation in the Amazon after the ranching agreements, we used information from the literature and our data on: i) the signatory and non-signatory companies of TACs, with data from all the states of the Brazilian Amazon obtained from the MPF; ii) the advances and failures in ranching agreements, including the results of the three audits of the companies that signed the agreement with Greenpeace (Marfrig, Minerva and JBS); and iii) the weakening of environmental policy in Brazil. We analyzed the forces in favor and against deforestation and their relation with the ranching agreements using the Lewin force field method (Ramalingam, 2006). This analysis allows one to evaluate the potential change in a situation considering the factors favorable to change (in this case, reducing deforestation) and the forces of resistance (favoring deforestation). First, we listed the forces based on a review of literature, recent events (e.g. changes in legislation) and promises of future actions (e.g. promises by companies and government of goals for reducing deforestation). Later, we assigned a score to the forces (from one to five), considering their power to influence changes or resistance. We considered that significant changes of behavior among ranching sector companies only occurred when the companies were boycotted or about to be, and/or when they were at heightened risk of legal penalties and/or threats to their reputation (which could lead to future market or funding losses). Such a pattern may be observed in the case of the Soy Moratorium that helped to reduce direct deforestation for soy planting in the Amazon (Appendix 1), and also in the restrictions that led ranchers with support from the government to expand control of foot-and-mouth disease in order to be able to export fresh beef (Appendix 2). Thus, we considered that restrictive, lasting and broadly applied actions are more effective against deforestation, whereas promises for the medium and long range and pilot actions are weak. In the same way, concrete actions in the short term that block measures against deforestation strongly favor deforestation. This analysis does not claim mathematical precision, but instead indicates the order of magnitude of the forces and identifies measures that may favor changes. To have access to the files with results from the audits we consulted http://www.greenpeace.org/brasil/pt/Noticias/Auditorias-reforcam-sucesso-do-Compromisso-Publico-da-Pecuaria/. We mapped 157 meat-packing plants in the Brazilian Amazon registered with SIF and SIE (complete list in Appendix 3). Of those, 128 were active (82%) and 29 inactive in May 2016 (Figure 6 and Table 1). The states of Pará, Mato Grosso and Rondônia togethers concentrated 62.9% of the active meat-packing plants, 75.3% of the cattle herd and 74,9% of the total pasture area in the Brazilian Amazon (Figure 7). Box 1 explains the probable causes of closing for meat-packing plants. The 128-active meat-packing plants belonged to 99 companies and together had a slaughter capacity of 59,824 animals a day (equivalent to 78% of the total slaughter capacity installed in the plants registered with SIE and SIF – Table 1). Forty-nine percent (63 out of 128) of the active meat-packing plants belonged to 38 companies that were signatories of TACs and totaled 70% of the active slaughter capacity (or 54% of the total installed slaughter capacity, including the inactive meat-packing plants). 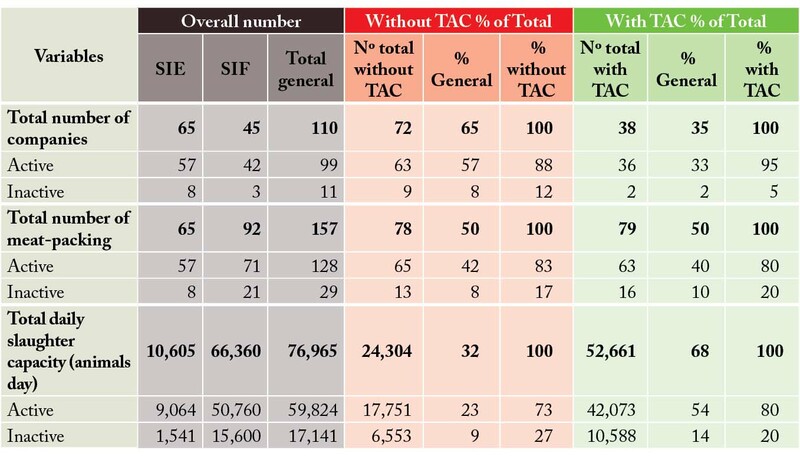 The meat-packing plants registered with the SIF represented 91% of the slaughter capacity of the active meat-packing plants signing TAC and the meat-packing plants registered in SIE totaled only 9% of that capacity. The three largest meat-packing companies (JBS, Marfrig and Minerva) are TAC signatories and owned 27 active meat-packing plants (21% of the active meat-packing plants) and 42% of the slaughter capacity of the active units. As for the 52% (66 out of 128) remaining active meat-packing plants belonging to 72 that did not sign, they accounted for 30% of the active slaughter capacity (or 24% of the total installed slaughter capacity, including the inactive meat-packing plants). Ten companies concentrated 59% of the total slaughter capacity of the active meat-packing plants. The remaining 41% are distributed among smaller companies (Figure 8). That distribution will have implications for the capacity to influence the intensification of problems or solutions for the sector, as we will discuss in section 4. The ten companies are JBS, Marfrig Global Foods, Minerva Alimentos, Mercúrio Alimentos, Masterboi, Vale Grande, Frigol, Frigon, Fribal and Cooperativa dos Produtores de Carne and Derivados de Gurupi. Box 1. Why were 18% of inactive meat-packing plants in 2016? Of the 29 inactive meat-packing plants, 21 (72%) were registered in SIF and 8 (28%) in SIE. The majority (14) were in Mato Grosso and Rondônia (9). Pará and Acre respectively had 2 and 4 inactive units. The daily slaughter capacity of the meat-packing plants ranged from 1,400 head (JBS in Vila Rica, MT) to 60 head (Frigovale Jaciara, in MT and Frigoisa, in RO). The average slaughter capacity of the inactive plants registered with SIF was 743 animals/day and with SIE, 193 animals/day. Four factors may have contributed to the deactivation of those meat-packing plants. The principal factor appears to be excessive investment in meat-packing plants in relation to the productive capacity in the region. 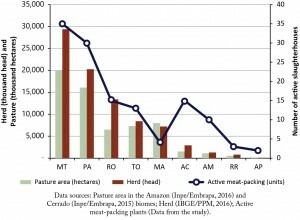 Supplying the installed capacity of the meat-packing plants with registration in SIE and SIF would require about 67 million hectares of pastures, an amount 13% greater than the 61 million hectares of pastures existing in the Brazilian Amazon, including pasture in the Cerrado portion in 2013 (estimated by Inpe/Embrapa, 2015) and the pasture in the Amazon biome portion in 2014 (Inpe/Embrapa, 2016). That estimate considered the typical productivity in the region and did not consider the meat-packing plants that supply only the municipalities (registered with the SIM) and exports of live cattle (See details in Appendix 4). As part of this investment, some of the large companies have bought and closed smaller plants. For example, 11 (or one third) of the 32 JBS plants were inactive. Another factor is the emergence of a market for exporting live cattle, especially in Pará, which reduced, at least in the short term, the supply of cattle for slaughter in meat-packing plants beginning in 2005. For example, the 650 thousand live animals exported per year from 2013 to 2014 would be enough to supply almost three meat-packing plants registered with the SIF or 10 meat-packing plants registered with the SIE, considering the respective average slaughter capacities of the closed meat-packing. The third factor is the prolonged drought, which also reduced the supply of cattle and consequently increased the prices, leading to the closing of plants (G1 MT, 2014; Estadão Conteúdo, 2015). The fourth and final factor is a reduction in demand due to the economic recession in Brazil in 2015 and the drop in exports, which led to a reduction in slaughters (Azevedo and Portugal, 2016; See Figure 1), which may have left some plants not feasible. The potential cattle-buying zones of the meat-packing plants reveal situations that are important for managing the zero deforestation agreements. The extent of the zones differs mainly due to slaughter capacity, which is influenced by the potential market (state or federal and export), the availability of cattle near the meat-packing plants and transport costs (land or river) (Figure 9). For example, in Acre, a meat-packing plant that supplies the local market and has an adequate in supply of cattle in the surrounding area, buys cattle up to a distance of by no more than 20 km. Meanwhile, in Amazonas, a meat-packing plant that supplies only the market in Manaus (a large city), but has a low local supply and accessible river transportation that is cheaper than land travel, buys cattle up to 1,050 km away, in the state of Rondônia (Figure 9). The largest zones were those of meat-packing plants registered with SIF, who can sell throughout Brazil and export, if licensed. The plants registered with the SIF have, on average, greater slaughter capacity (708 animals/day), demand more suppliers and travel greater distances (on average 360 km) to purchase animals. A packing plant registered with SIF would need, on average, approximately 580 thousand hectares of pasture to meet its annual demand, considering total use of its average slaughter capacity and average pasture productivity of pastures. The potential buying zones of the meat-packing plants registered with SIF were, on average, about 15 million hectares. For their part, the meat-packing plants registered with the SIE (who sell only in the state where they are located) had an average slaughter capacity of 181 animals/day (maximum installed of 500 animals/day and minimum of 15 animals/day), buy cattle at an average maximum distance of 153 km and require a pasture area four times smaller than a meat-packing plant registered with SIF to supply their annual demand (Table 2). The potential buying zones are much larger than the total pasture area necessary for supplying the plant because the pastures are scattered throughout regions that include other land uses, Conservation Units, Indigenous Lands and areas that are unsuitable for pastures. Furthermore, in general, there are several meat-packing plants operating in the same region (whose purchasing zones overlap) and they must buy cattle at distances greater than those of their immediate surroundings. Overlapping purchasing zones are more intense where there are more cattle and several meat-packing plants installed, such as in Mato Grosso, eastern Pará and Rondônia (Figures 10 to 15). The maps show that there is a wide overlap of meat-packing plants with and without TAC in various regions, which creates a risk of leakage – when a TAC signatory refuses to buy from an irregular ranch, the rancher can sell to another buyer without TAC or to one with a TAC who is not fully complying with the agreement. Ranchers in Pará can sell to meat-packing plants without TAC in their own state or in neighboring states such as Tocantins, Amapá, Amazonas and Maranhão (Figures 14, 16, 18 and 19). Meat-packing plants in Amazonas without TAC also buy from Rondônia and can thus export the deforestation risk to that state. 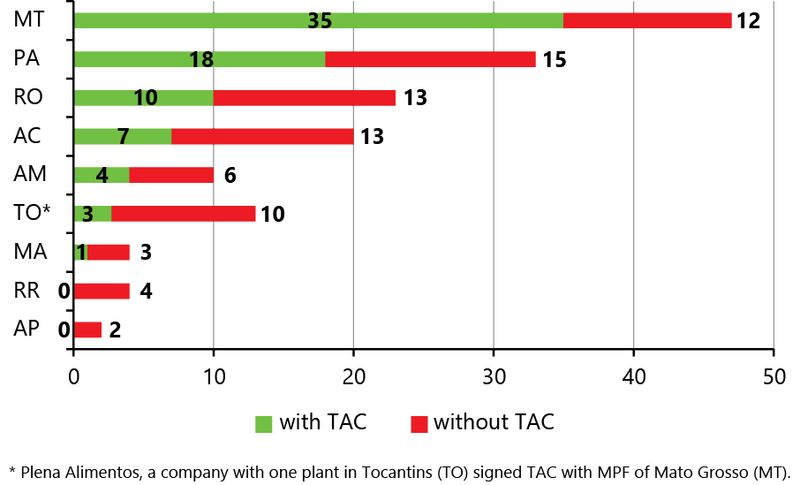 Meat-packing plants without TAC in western Acre can buy from southern Amazonas (Figure 17). In section 3.5.1 we will discuss this risk of unfair competition. That information was validated by data from Carrero et al. (2015) and by information collected from cattle raisers and employees of the state sanitary defense agency in Roraima (Aderr). 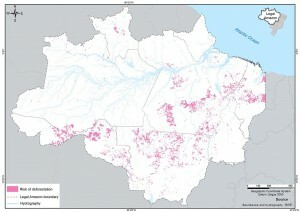 That meat-packing plant is supplied by cattle coming from municipalities in the extreme south of Amazonas (Humaitá, Apuí, Lábrea and Canutama), Roraima (Rorainópolis, São João da Baliza, São Luís do Anauá, Caroebe, Iracema and Mucajaí), Rondônia (Porto Velho, Ariquemes, Guajará-Mirim and Ji-Paraná) and Pará (Novo Progresso, Altamira, Anapu, Trairão and Vitória do Xingu). Listed in Mapa/SDA (2016) as licensed to export meat in natura and offal to the United Arab Emirates, Egypt and Hong Kong. Data from Mapa (2016) show that of the animals slaughtered in plants registered with the SIF in the state of Mato Grosso in 2015, more than 128 thousand came from the Pará municipalities of Novo Progresso, Itaituba and Altamira. Only in August 2015 did a packing plant register with SIF begin activities in Novo Progresso, in western Pará, with na installed slaughter capacity of 500 animals/day.. The company bought from the Pará municipalities of Altamira, Brasil Novo, Monte Alegre, Prainha, Vitória do Xingu and Uruará, according t o data from Soares et al. (2014) and from State Agency for Sanitary Defense of Amapá (Diagro). 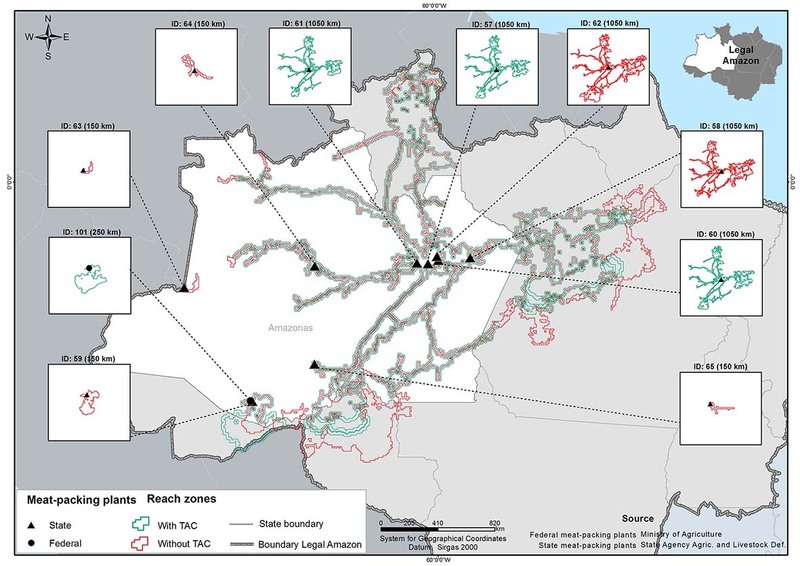 The potential buying zones of the 157 meat-packing plants registered with the SIE and SIF in the Amazon in 2016 indicate the extensive zone of influence of the sector, which buys cattle through a network of official and informal roads and the main navigable rivers (Figure 20). Ninety-two percent of the total pastures existing in the region in 2013-2014 were inside potential buying zones of all meat-packing plants, active and inactive (Figure 20). The potential buying zones of the 128-active meat-packing plants covered 91% of existing pastures. 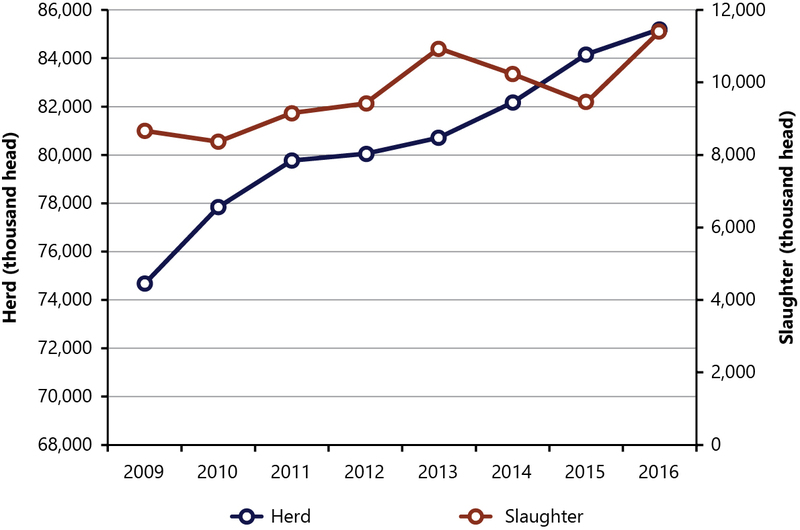 The broad reach of the meat-packing plants over the pastures was already expected because all of the units registered with the SIE and SIF were responsible for 93% of the slaughters accounted for by IBGE in 2016. The small portion (8%) of pastures that are outside those zones probably directly supply slaughterhouses and local meat-packing plants registered with the SIM or are clandestine and not considered in our analysis, and may also include ranches specializing breeding and rearing herds that supply other fattening ranches inside the supply zones of the larger meat-packing plants (registered with the SIF and SIE). We estimate that the 99 companies owning the 128 active plants influence the behavior of about 390 thousand ranches with a herd of approximately 79 million cattle. It is relevant to note that maximum purchasing distance of the meat-packing plants also reached zones that were not yet pastures in 2013-2014. That indicates that it would be economically viable for meat-packing plants to buy cattle from new pastures that were opened in areas still under forest cover from 2013 to 2014. In other words, if the companies do not fulfill the agreements and/or if the companies that did not sign agreements continue not having any commitment, there is a risk that the meat-packing plants will encourage new deforestation. The potential cattle-buying zones of the meat-packing plants overlap the largest portion of the region at some type of risk associated with deforestation (Figures 21, 22 and 23). 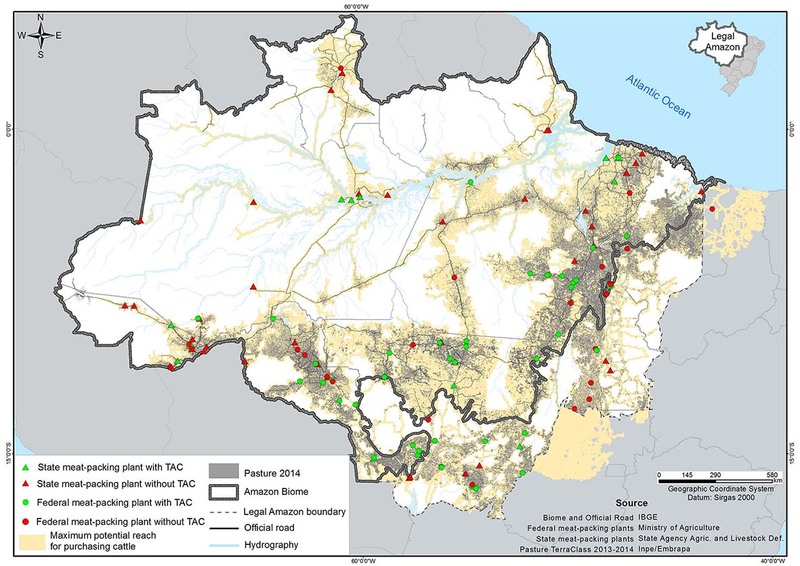 About 2,3 million hectares embargoed by Ibama in the Brazilian Amazon are in the potential buying zones of all of the meat-packing plants (Figure 21) – which is equivalent to 88% of the total of embargoed areas in the region. The areas embargoed are mainly in the states of Mato Grosso, Pará and Rondônia. The meat-packing plants can consult the Ibama list and avoid buying cattle from those areas. However, ranchers have gotten around the list by leasing the areas to other persons and making control more difficult, as will be detailed in section 3.5.2. In the same way, 88% of deforestation from 2010 to 2015 in the Brazilian Amazon occurred inside the mapped potential cattle-buying zones of the meat-packing plants registered with SIE and SIF mapped (Figure 22). Mato Grosso, Pará and Rondônia concentrate the highest levels of recent deforestation. Although those areas had not been embargoed, it is very probable that they had been illegally deforested, since deforestation for agriculture and livestock is rarely licensed. For example, in 2016 it was informed that 95% of deforestation in Mato Grosso occurred without licenses (Mundel, 2016). Additionally, we estimate that 1.68 million hectares of forests are at the highest risk of deforestation from 2016-2018 if the average rates for the 2009-2014 period are maintained (See Appendix 5). About 90% of those at-risk areas are in the potential buying zones das meat-packing companies mapped (Figure 23). The states of Pará, Mato Grosso and Rondônia total 72% of the deforestation risk over the next three years. Pará leads with an accumulated 31.4% of the total risk, in areas close to the BR-163 and the middle and southern parts of the state, especially in and around the municipality of São Félix do Xingu, the leader in terms of both deforestation and cattle herd in the state. Mato Grosso is second, with 26.6% of the risk, in areas in the northern part of the state, distributed close to the BR-163 and BR-158 federal highways, and northwest, in an area distributed along the MT-322 state highway. Deforestation along the BR-163 coincides with a meat-packing plant buying area in northern Mato Grosso, southwest Pará and Manaus area. Finally, Rondônia concentrates 13,4% of the deforestation risk, mainly in the north, in areas that supply meat-packing plants in the state and also Amazonas. If the meat-packing plants continue buying without control over their direct and indirect suppliers ranchers will continue to be encouraged to deforest those areas at greatest risk. A company’s exposure to the risk of buying cattle obtained from deforestation was greater, when the sum of embargoed areas by Ibama for illegal deforestation up to November 2016, the areas deforested from 2010 to 2015 and the areas at risk for deforestation from 2016 to 2018 in the potential buying zone of its plants, in hectares, was also greater (Figure 24 and Appendix 6). Thus, the farther the purchasing distance of each plant and the greater the number of plants for each company, the greater was its exposure. The variation in the exposure to risks made it possible to divide companies into classes according to the internal variance of each group. The JBS company was alone at the top of the ranking for exposure to risk, totaling 4.6 million hectares with some type of risk in the potential buying zones of its 32 plants, 21 of which active. Of the total of at-risk areas, 17 million hectares were embargoed, 16 million hectares were deforested during 2010-2015 and 1.2 million hectares were of forests at risk of deforestation from 2016 to 2018 (more information on the JBS units in section 3.4.1.1). JBS signed a TAC and achieved control over its direct suppliers. Nonetheless, the lack of control over the indirect origin of cattle leaves the company vulnerable to the risk of indirect purchases from areas with recent deforestation or under embargo. In fact, in April 2017 Ibama accused two JBS plants of buying 49,438 head of cattle from embargoed ranches that indirectly supplied cattle (See details in Appendix 8). The total area at risk in the JBS potential buying zones was approximately three times greater than that of the company occupying the second place in the ranking. The Redentor meat-packing plant occupied the second position in the ranking with only one plant, but in a region with high rates of embargos (965 thousand hectares), recent deforestation (270 thousand hectares) and high risk of future deforestation (342 thousand hectares). The plant is located in the extreme north of Mato Grosso and its buying zone extends to southwestern Pará, along the BR-163. In the second group, together with Redentor, are four companies (3 registered with SIF and one in SIE) at the top in terms of risk, totaling from 1.2 million a 1.6 million hectares at risk. The other companies in this group include Vale Grande (3 plants), Frigo Manaus (1 plant), Marfrig (5 plants) and Mercúrio (2 plants) (Figure 24). In the second group of exposure to risk we identified 14 companies, 10 registered with SIF and 4 with SIE. 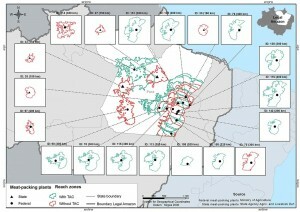 With exposure to risk varying from approximately 630 thousand to 995 thousand hectares, the companies located in this group source cattle in regions with a high incidence of embargoed areas or with high rates of recent deforestation, for example, Brasfri, in Mato Grosso, and T. M. da Silva de Carvalho, in Pará. The four companies registered with SIE (all in Amazonas) in this group are notable for buying animals from long distances in areas with high rates of recent deforestation in Rondônia and Pará. The companies in subsequent rankings (with less than 630 thousand hectares at risk) have distinct characters in relation to the indicators evaluated. For example, the Fribal company, with two plants in Maranhão, is exposed to intermediate risks, recent and future deforestation and is active in areas with low levels of embargoed areas. In this classification are also meat-packing plants active in areas with high historical deforestation, and thus operating in areas with little or no forest remnants, such as the Rio Maria meat-packing plant, in Pará. This intermediate group and the low risk group are notable for concentrating 88% of the company’s que have not signed TAC. The group of companies with potential buying zones at lowest risk (with 651 hectares to 50 thousand hectares of at-risk areas) ranges from small companies with a local market (e.g. J.P. meat-packing plant, in Acre, which buys cattle at a maximum distance of 20 km, registered with SIE) to companies that are medium-sized companies, but are active in zones with high accumulated old deforestation and thus low remaining forest areas (e.g. Casfrisa and Arrudão, in Castanhal-PA), or that operate in zones inside the Cerrado biome (e.g. Boi Brasil meat-packing plant, the only one in the group registered with SIF, installed in Alvorada-TO). JBS maintains a site with information on the origin of its beef. Other companies have also begun actions seeking transparency on the origin of their beef; however, the data available do not yet reach the indirect suppliers, are insufficient or were discontinued (See Appendix 7). Complete list in Appendix 6. Since JBS is by far the largest company, in Figure 26 we highlight the exposure of all of its plants. The 32 JBS plants together cover a potential buying zone overlapping 38 million hectares of pastures in 2013-2014, or 75% of the total in the Brazilian Amazon. These plants situated in northern Mato Grosso are more exposed to the deforestation risk (Figure 27). In this group are plants in Matupá, Colíder (2 plants) and Alta Floresta, municipalities with high incidence of embargos. 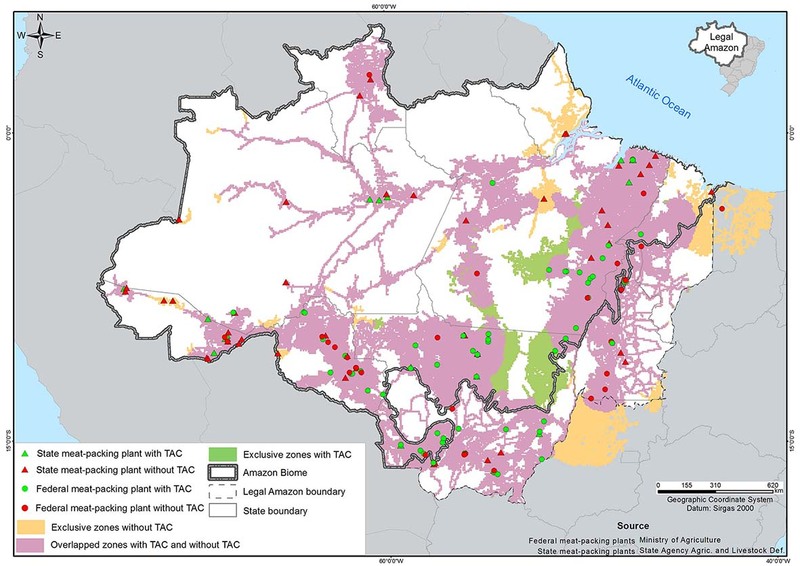 At the next level we found four JBS plants: two in Pará (municipalities of Tucumã and Eldorado dos Carajás), one in Mato Grosso (Juara) and one in Rondônia (Pimenta Bueno), in regions with a large incidence of recent deforestation (2010- 2015). At an intermediate level are plants situated in Rondônia (3), Mato Grosso (2), Tocantins (1), Pará (1) and Maranhão (1). Despite the geographical diversity, the potential buying zones with high rates of recent deforestation are notable. In the latter group there are 12 meat-packing plants, located in Mato Grosso (7), Rondônia (2), Pará (2) and Acre (1), that have zones with a large number of embargoed areas (e.g. in Água Boa-MT and Diamantino-MT), with a high concentration of recent deforestation (e.g. units in Rolim de Moura-RO and Rio Branco-AC) and with high risk of future deforestation (e.g. units in Araputanga-MT and São José dos Quatro Marcos-MT). JBS also has units with low exposure to deforestation risks because they are in zones in the Amazon biome that are already highly deforested or in transition zones such as the Cerrado, whose deforestation we have not assessed. In Mato Grosso there are four JBS plants with lower exposure to the risk: in Pedra Preta, Cuiabá, Barra do Garças and Pontes e Lacerda (Figure 27), with the first three located in the Cerrado biome. That does not mean the risk will not increase if environmental authorities intensify activities against deforestation in the Cerrado and embargo areas in this biome. The exposure to the risk associated with deforestation is also diverse among the 72 companies that did not sign the TAC (Figure 28). Frigo Manaus is noteworthy because it buys in a zone that can reach animals at a distance of more than 1,000 km during the rainy season, when the supply of animals in the environs of Manaus becomes scarce. The risk in the buying zone totals almost 1,5 million hectares, of which 314 thousand hectares are of embargoed areas, 884 thousand are of deforestation from 2010-2015 and 278 thousand are of at-risk areas of new deforestation during the 2016-2018 period, including in Rondônia. A second group with greater exposure (from 572 thousand to 997 thousand hectares) includes ten companies that buy from long distances (e.g. Bovinorte, in Manaus-AM) or who have more than one plant (e.g. Total, in Rolim de Moura-RO and Ariquemes-RO and Distriboi, in Cacoal-RO and Ji-Paraná-RO) or companies located in areas under great pressure for new deforestation (e.g. T. M. da Silva de Carvalho, in Novo Progresso-PA). In that group are nine companies registered with the SIF, that may sell meat and byproducts on the domestic market, and, if licensed, on the international market as well (Figure 28). In a third exposure group (231 thousand to 518 thousand hectares) are 14 meat-packing companies without TAC, of which 8 are registered with SIF. “Among the characteristics of these companies are determining factors related to exposure to deforestation risk, such as location. Four are in Rondônia, three in Mato Grosso and one in Pará, states notable for recent deforestation. Two companies with registration in SIE located in Amapá stand out for sourcing animals at greater distances, teaching areas with a high rate of recent deforestation in Pará. The following groups, below 227 thousand hectares of risks, concentrates meat-packing plants registered with SIE, with a low slaughter capacity and demand for few animals, which are bought from nearby areas. Some companies do not present a risk of exposure to embargoed areas (e.g. 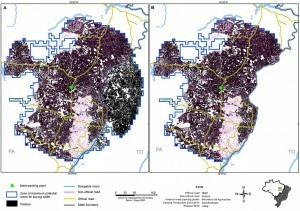 Frigodhias, in Axixá-MA and Matadouro Amazônia, in Bragança- PA) or to deforestation risk (e.g. Frigorífico São Jorge, in Cáceres-MT and Frigovale Jaciara, in Jaciara-MT). Four factors explain the persistence of deforestation in the potential buying zones of meat-packing plants, even those with agreements, as we will describe below. Seventy-eight meat-packing plants – or half of the total – belong to companies that have not signed the ranching TAC and there are no indications that they have been voluntarily adopting methods to verify if their suppliers are not irregularly deforesting. The meat-packing companies that lack such control methods probably buy from illegally deforested areas, voluntarily or not. Thus, ranchers who are boycotted by the companies that sign TAC may sell to companies without control methods, in what we call “leakage from the agreements”. The active packing plants whose proprietary companies had not signed TAC had a slaughter capacity equivalent to 30% of the total installed capacity active in 2016. Supplying that capacity would demand a potential area of 16 million hectares (or 26% of the total pasture area) of pastures per year, considering the typical productivity of the regions where they operate. The risk of leakage is broad, because there are non-signatory companies in all the states in the region, that are owners of 23 active meat-packing plants registered with SIF, which can export beef to other states and even to other countries (Figure 29). The sum of the potential buying zones of the companies without TAC is significant, encompassing 87% of all pastures, 81% of recent deforestation, 73% of the area embargoed and 75% of the area at risk of deforestation from 2016-2018. The majority of the non-signatory companies concentrate their meat-packing plants in Pará, Mato Grosso and Rondônia, where deforestation have historically been higher (Figure 30). Acre also stands out for its number of small-scale plants registered with SIE, whose proprietary companies have not yet signed the agreement. The leakage from the agreements may occur both inside and between states. For example, ranchers boycotted by companies that signed agreements in the southeast of Pará, where the first TACs were signed, informed us that they were able to sell to companies without TAC in Tocantins. This may explain the 144% increase in the number of animals from Pará slaughtered in meat-packing plants registered with SIF in Tocantins after the signing of TACs in Pará from 2008 to 2015: from 54 thousand to 131 thousand animals according to Mapa. Furthermore, from 2009 to 2015, Pará had a 76% increase (from 72,8 thousand to 131.5 thousand) in the sale of animals for slaughter to meat-packing plants registered with SIF in Mato Grosso; and in 215% the sale of animals for slaughter in meat-packing plants with SIF in other Brazilian states such as São Paulo and Goiás. The sale of animals to other states fell in 2015, probably because of the economic recession according to data from Azevedo and Portugal (2016) and Mapa/SDA (2016a) (Figure 31). The increase in sales of fattened cattle from Pará for slaughter in meat-packing plants registered with SIF in other states from 2009 to 2014 totaled 210 thousand animals per year. This volume would be sufficient to supply for one year the average slaughter capacity of 4.6 meat-packing plants with SIE state registry 1.2 meat-packing plant with SIF registry. That means unfair competition between those who have signed agreements and those who have not signed or do not keep them. Thus, to avoid the environmental and economic damages of leaking it is necessary to act so that other companies will sign the ranching TAC or equivalent agreements. It is worth noting that in 2016 the MPF in Tocantins tried, without success, to negotiate agreements with the meat-packing plants in the state that are not part of the large groups that have already signed agreements valid for all of the Amazon (Personal communication with MPF-TO on July 11, 2016). In April 2017, Ibama fined three meat-packing plants from Tocantins accused of buying 3,461 head of cattle from embargoed areas in Pará, as we detail in Appendix 8. The tendency for an increase in the number of animals from Pará slaughtered in Tocantins was changed only from 2012 to 2014, when the price of cattle was favorable for exporting live animals to other countries. About half of the meat-packing plants (79) belong to 38 companies that signed TAC and committed to verifying if their direct suppliers (fattening ranches) have not deforested after October 2009 and were free of other irregularities, such as slave labor. Of the 79 units, 63 were active in 2016, the equivalent of 49% of the total of plants in activity. 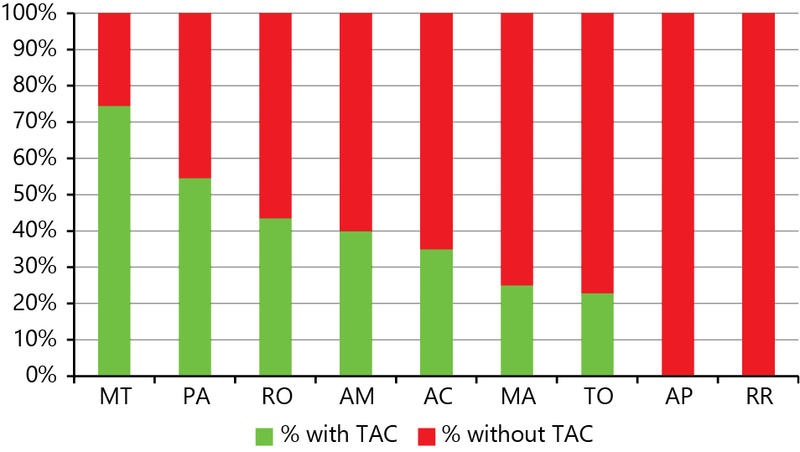 The proportion of meat-packing plants that signed the TAC with MPF varies by state, with Mato Grosso and Pará being responsible for 69% of the total (Figure 32). Compliance with the agreements needs to be verified annually through independent audits funded by the public authority (in the case of Pará up to the first audit) or by the companies themselves, in the other states of the Brazilian Amazon, in the case of a commitment endorsed by Greenpeace and the agreements with the MPF. There is evidence that some of the signatory companies have invested in control systems to do that verification (Gibbs et al., 2015; BDO, 2016; BDO, 2016a; DNV GL, 2016). According to Gibbs et al. (2015), adoption of controls by the JBS company has led to an increase in the number of ranches registered with CAR in Pará and the reduction of deforestation on such ranches. However, some ranchers and traders get around the agreements and cattle obtained from illegal fattening ranches arrive at the meat-packing plants of companies that are signatories of the agreements as if they were of legal origin, meaning they have been “laundered” (Gibbs et al., 2015; Tinoco and Sá, 2016, field data). The set of interviews revealed that ranchers adopt the following forms of laundering: i) registering in CAR only the portion of the ranch free of irregular deforestation and, based on in this CAR, selling the cattle raised in the portion with irregular deforestation; ii) “Borrowing” the CAR number and GTAs from a regular ranch to sell cattle obtained from an irregular ranch; iii) selling cattle from a ranch without CAR and/or embargoed to one with CAR, who then sells the cattle immediately to a meat-packing plant; iv) leasing the embargoed ranchers to other ranchers, who sell the cattle using documents (CPF, CNPJ, CAR) different from those on the embargo lists from Ibama or the states; and v) remove the part of the property with irregular deforestation from CAR, as may be observed in Figure 33. This last form of laundering began to occur, at least in Pará, after a new cost-free system was made available to the meat-packing plants for checking the occurrence of deforestation (Barreto & Gibbs, 2015). That system was constructed by demand from MPF after a pilot audit identified the laundering mechanisms (Barreto & Gibbs, 2015). Since that form of laundering occurred in 2017, it is clear that the public authorities are not yet punishing such frauds. Furthermore, some audits have not verified the history of changes in the CAR areas and, for that reason, may fail to identify the occurrence of frauds. Laundering has persisted because progress with the audits is limited. In Pará, after a delay of three years, in 2013 the state government contracted a pilot audit of compliance with the TAC by three companies. The audit crossed the CAR data of all the ranches registered with the state with the data from all the GTAs for transporting cattle for slaughter in 2012. Thus, the auditors have been able to identify the mechanisms for laundering and leakage. However, a new conclusive audit has not been done for all of the signatory companies and the one that began in the second quarter of 2017 has not yet been concluded. In Mato Grosso, the MPF has received the audits contracted by some companies, but has not made the results available to us because they consider that the reports are confidential due to containing “data from suppliers and commercial operations carried out by each one of the meat-packing plants.” The MPF stated that it would meet with representatives of the meat-packing plants for the purpose of making the results of the audits (Paiva, 2017). The three signatory companies (JBS, Marfrig and Minerva) of the public agreement proposed by Greenpeace, who account for more than 45% of the installed slaughter capacity of the Brazilian Amazon, have contracted independent audits that have verified that, in general, the agreements have been met (Appendix 9). However, the methodology of those audits was different from that developed for the TAC audit in Pará. The audits contracted by the signatories did not have access to the data from GTAs of all the sales by direct and indirect suppliers, which makes it impossible to identify some of the laundering mechanisms. For example, without the GTAs for all the transactions it is impossible to detect if a regular ranch is laundering cattle from an irregular ranch. That type of verification would be especially important in the case of those three companies, who may be keeping ranchers with Ibama embargoes as direct suppliers. That happens because there is an understanding that in according to the purchasing criteria defined by Greenpeace the embargo is restricted only to the property, not to the proprietor. Thus, ranchers who have more than one property, with some under embargo and others not are selling animals obtained from a property without an embargo (with a different name from the embargoed one and/or in another municipality) may do business with the meat-packing plant. We thus understand that due to verification failures with the GTA, there is no way to confirm that those cattle have not spent some part of their life cycle on an embargoed property. For example, the owner can raise calves and steers (breeding and rearing) on an embargoed ranch and, when they are ready for slaughter, sell the animals to a meat-packing plant under the registration of a non-embargoed property. However, it is important to note that verification of GTAs in the audits alone is not a definitive measure against laundering, since there is evidence of failure in enforcement of the use of those guides. For example, a recent news article showed that ranchers and cattle traders in São Félix do Xingu, in southern Pará, were using GTAs to transport cattle from places that are not their sources (Tinoco and Sá, 2016). Although a complete survey is not available, it is known in the sector that a significant number of the cattle that arrive at the meat-packing plants have spent part of their lives on at least one other ranch before arriving at the fattening property. For example, the Marfrig group found that only half of its purchases were from ranches that did the complete cattle-raising cycle (Almeida, 2016). Thus, at least half of the purchases included cattle that had spent part of their lives on other ranches. Ranchers interviewed recognized that deforestation occurs on indirect supplier ranches. Meanwhile, in general, the promises of control over all suppliers were not met, were delayed or are incipient. 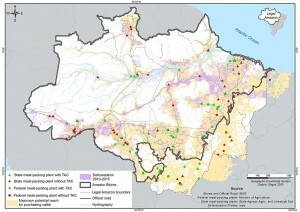 For example, the Boi Guardião (Guardian Cattle) Program from Mapa (Box 2) mapped almost 347 thousand hectares of new deforestations in 33 municipalities in southeastern Pará from 2009 to 2011 (Latis, 2011 – Figure 34). However, that information was not used to refuse the issuing of GTAs to ranches that had deforested illegally. Since then Mapa has stopped mapping deforested areas. Additionally, the guideline established by BNDES for demanding traceability of the herd that supplies the meat-packing plants that it finances was also not met (BNDES, 2009a). Currently, only one company (Marfrig) reports that it is trying to control the indirect suppliers, but with a method that is still insufficient (Appendix 9). Other control initiatives involving companies are still at the pilot stage, with a small group of ranches in northern Mato Grosso (which JBS stated that it was supporting, in a report) and in southern Pará (where they partner with Marfrig) (See Appendices 10 and 11). Four years after the failure of the Boi Guardião Program, starting in June 2015, the government of Pará decreed that it would gradually adopt the Green GTA – meaning that it would only issue the GTA to ranches registered with CAR. However, this control began only in November 2016 after pressures from the MPF is to include the entire herd beginning in October 2018 (Semas, 2016) (Appendix 12). That is a wise decision, but it needs to be Complemented by a rigorous verification of GTAs and CAR because of evidences of frauds presented in the previous section (See Figure 33). Therefore, as long as the indirect suppliers are not fully controlled, the risk of deforestation associated with them will continue. See BDO audit reports (2016); BDO (2016a) and DNV GL (2016). For the Marfrig case see page 9 (DNV GL, 2016), for JBS see page 7 (BDO, 2016) and for Minerva see pages 7 and 13 (BDO, 2016a), which inform the possibility and the terms for unblocking properties of those who have their CPF cited in other embargos at Ibama. For example, a rancher in Southern Pará reported that he raised the cattle in a ranch inside an Indigenous Land and later transported themfor fattening on another ranch he owned in a neighboring municipality. Because this second ranch was legalized and free of recent deforestation, he had no problems in selling the cattle to meat-packing plants near his fattening ranch. In December 2009, then minister of Agriculture, Reinhold Stephanes, launched the Boi Guardião (Guardian Bull) Program in southern Pará, which sought to curb trade in cattle of from deforested areas by denying to issue GTAs to ranches with new deforestation (Froufe, 2009). To that end, the program would cross maps from newly deforested areas to be compiled by the federal government with the coordinates of ranches to be supplied by the Pará government and verifications would be made in the field. The minister declared to the press that producers would benefit by guaranteeing an increasingly demanding market that seeks to know the origin of the beef and that “Boi Guardião will lead us to zero deforestation”. The program was to begin in a pilot form in southern Pará and would later be expanded to Mato Grosso and Rondônia by 2011. At the ceremony, the minister also signed an agreement for implementing the program with representatives of the government of Pará, BNDES, supermarkets and meat-packing plants. The persistence of, and increase in deforestation after the agreements have also resulted in a strong reaction from the rural sector against the forest protection policies and against the agreements themselves. There is evidence that those reactions have increased the belief in impunity. In 2012, the Executive and Legislative branches revised the Forest Code and forgave part of the illegal deforestation done before 2008. According to studies, that measure enabled the amnesty of the illegal deforestation of 29 million (Soares-Filho et al., 2014) to 41 million hectares (Girardi, 2017). A director at Ibama declared that the pardon was stimulating new deforestation (Lourenço, 2011). Since the change in the Forest Code, the deforestation rate increased 75% by 2016, according to governmental data (Inpe, 2016). From 2013 to 2016, the Legislative and Executive branches delayed the deadline for beginning registration in CAR three times. From 1995 to 2013, the government and Congress reduced 2.9 million hectares from Conservation Units in order to validate irregular occupations and facilitate hydroelectric dam construction (Martins et al., 2014). Even after the deforestation increased in 2015, in December 2016, the president of Brazil issued a provisional measure reducing the level of protection for UCs in western Pará, going against the recommendation of the Chico Mendes Institute for Biodiversity Conservation (ICM- Bio) and a lawsuit filed by the MPF in Pará (MPF-PA, 2016a; Lima, 2017). That measure also encouraged congressional representatives from Amazonas to demand the reduction of 1 million hectares in other Conservation Units created in 2016 (ISA, 2017). In 2015, the federal government established the goal of zero illegal deforestation by 2030 as part of its goal of reducing greenhouse gas emissions. That measure was interpreted as signaling tolerance (Campos, 2015). Besides weakening the rules, the public sector reduced the number of personnel responsible for implementing them. From 2010 to 2016, the staff of environmental analysts at ICMBio was reduced by 40%; and from 2009 to 2015 the number of analysts at Ibama was reduced by 33% (Araújo et al., 2017). It is relevant to note that the Executive and Legislative branches have weakened policies although scientists, civil society and the population support forest protection. For example, the Brazilian Society for the Progress of Science published a report against the changes to the Forest Code (SBPC, 2012) and 1.3 million persons signed a petition (Vilar, 2011) against such changes. Furthermore, one opinion poll demonstrated that 79% of those consulted were against the amnesty for deforestation and another showed that 91% were favorable towards forest conservation (MMA, 2012). The weakening of the environmental policies was probably facilitated by the massive financing by agribusiness of electoral campaigns for a large number of politicians. Studies show that in Brazil members of parliament vote in harmony with campaign funders and that the companies that fund them receive more public benefits, such as subsidized credit (Mancuso, 2015). The leniency agreement of the director of Institutional and Government Relations at J&F (the main holding of JBS) and its controller partner illustrate the power of influence held by the agriculture and livestock sector. Members of parliament who defend the sector have been informally called the cattle bench or the beef and barbecue bench (bringing together those funded by meat-packing companies and breweries) (Toledo et al., 2014; Martins, 2015; Medeiros and Fonseca, 2016). 4. Will ranching continue to be associated with deforestation in the Amazon? aigns led to agreements by half of the meat-packing plants against deforestation, and they control 70% of the active slaughter capacity. However, we have demonstrated that deforestation continues, since 30% of the slaughter capacity still operates without commitments, and that there are weaknesses in implementing the agreements to control direct suppliers (including frauds) and lack of control over indirect suppliers. Will the agreements made by the companies be consolidated and expanded and lead to a drastic reduction in deforestation? Or will a part of the market continue buying from ranchers who deforest? We next discuss the forces for and against deforestation that may determine the answers to those questions, considering the facts and tendencies summarized in the previous section and in Table 3 later in this report. The forces are more favorable to deforestation and, new government measures and the increasing demand for beef are strengthening the threats. In 2016, exports increased after the Chinese market was opened (Freitas, 2016). Meanwhile, the federal government continues to block access to data identifying the owners of properties registered in CAR and on cattle transport (GTAs), which could facilitate control over cattle sold directly and indirectly. Moreover, the President of Brazil has issued provisional measures that were converted into law by Congress, which reduce the level of protection of Conservation Units and extend the deadline for illegal occupants to request regularization of titles to public lands (Bragança, 2017). In May 2017 several groups, including the Brazilian Coalition on Climate, Forests and Agriculture, which brings together companies, NGOs and academics, suggested that the president veto the reduction of protection for Conservation Units (Coalizão Brasil, 2017). In April 2017, Ibama’s operation Carne Fria (Cold Beef), with great potential against the meat-packing plants and embargoed ranches, was opposed by the federal government itself, by regional politicians and by the Judiciary (Details in Appendix 8). The operation resulted in 172 notices of violation and a total of R$ 294 million in fines and embargo of 15 meat-packing plants accused of directly and indirectly buying almost 59 thousand head of cattle from 24 embargoed ranches (Ibama, 2017). The transformational potential of the action was weakened, at least in the short term, because of the court-ordered release from the embargo of two meat-packing plants under the argument that the number of cattle bought illegally by the meat-packing plants was negligible if compared to the number of head sourced legally over the last few years. Ibama also lifted the embargo on four meat-packing plants after administrative appeals (See Appendix 8). Ibama was also weakened by reactions from politicians and ranchers in Pará and President’s office. Under pressure, the Environment minister apologized to the producers and declared that operation Carne Fria had been poorly timed because one week before another operation (Carne Fraca, meaning weak beef) had hit meat-packing plants accused of evading sanitation controls in the country (Poder360, 2017). According to the minister, the operations would weaken the sector, on which Brazil depends very much economically. The interim superintendent of Ibama in Pará who participated in preparing operation Carne Fria was dismissed (Pegurier, 2017). Despite the setbacks, Operation Carne Fria may result in advances. In the decisions lifting the administrative embargo, Ibama demanded that the companies released presented solutions in 90 days to avoid purchases from irregular areas. After that, according to a consultant from the region, some of the large Brazilian supermarkets have requested information from meat-packing plants accused by Ibama and indicated that they may stop buying if the answers are not satisfactory. That demand is helping to accelerated development of a pilot project for controlling indirect suppliers that was being discussed by ranchers in Pará (See Freitas, 2017). Participants in the project hope to launch a system in July 2017. According to the same consultant, the cost of traceability of the cattle from the beginning of their life will cost something like R$ 15 per animal. Therefore, that amount, equivalent to about ten cents of a Real per kilo of deboned beef, would be negligible. This type of initiative could gain scale with the participation of more public and private actors as happened with the successful program for fighting foot-and-mouth disease (Appendix 2). The meetings that the Pará government called to assess options for improving implantation of the TAC after operation Carne Fria (Corrêa, 2017) may be a space for expanding the pilot initiatives. The first meetings included Ibama, MMA, MPF, producers and meat-packing companies. The project could be accelerated with the participation of the major buyers of products from the meat-packing plants and the necessary sectors of the government, such as Mapa. As our data show, fewer than 50 companies are responsible for the great majority of slaughter. Operation Carne Fria may also result in other indirect impacts. Ibama suggested to the MPF of Pará that they carry out the sanctions established in the Beef TAC against the signatory meat-packing plants that disobeyed the agreement by sourcing cattle from embargoed areas. Because the TAC can be enforced extrajudicially, the sanctions could be applied more rapidly than in administrative and legal proceedings. Therefore, the effect of the operation in the short term will depend, to a large degree, on the MPF’s decision. The MPF informed that it is waiting for the meat-packing plants to express their positions before deciding on the Ibama recommendations. In the short term, the TAC audits and the TAC sanctions resulting from operation Carne Fria may be the most promising events against deforestation. 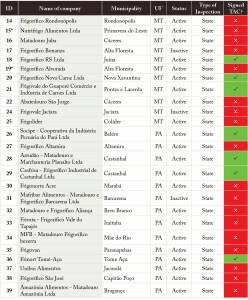 Twenty-two companies that signed the TAC in Pará and 12 in Mato Grosso have contracted independent audits. If the MPF and the market punish the companies that violate the agreements, more companies will tend to strengthen control, including over indirect suppliers. However, to guarantee the sustainability of the positive effects of operation Carne Fria it will be important to reduce illegitimate negative political interferences. Operation Lava Jato (Car Wash) and its associated operations, which are investigating corruption in Brazil, have demonstrated that it is possible by exposing heads of public agencies and their funders at various large companies, including JBS (Fabrini, 2017). The use of communications strategies has been one of the means used by the Lava Jato coordinators to obtain popular support (See analyses by Mendes, 2016 and Macedo Jr., 2016) and, thus, confront political pressures. Therefore, a similar approach might be used by public managers responsible for fighting deforestation. The strengthening of communication could have two components. One would clarify the negative effects of deforestation, such as premature deaths from respiratory diseases, losses of funds due to corruption and the appropriation of public resources (land fraud and logging on public lands), and social problems, such as violence and slave labor (See examples in MPF-PA, 2015; MPF-PA, 2016b). The other component would demonstrate that reducing deforestation has not impeded nor will it impede economic development in the country, since it is possible to increase production in the vast deforested areas that are poorly utilized, both in the Amazon and the rest of the country (See analyses in Barreto and Silva, 2013; Iasi, 2014; Strassburg et al., 2014; Observatório do Plano ABC, 2015). A recent article by two Brazilian researchers, one from Embrapa and the other from Inpe exemplifies a communication product to influence forming opinions about the issue. In the Valor Econômico newspaper Nobre & Assad (2017) defend a moratorium on beef in the Amazon along the lines of the Soy Moratorium in order to avoid environmental damage and to guarantee sustainability in agriculture and livestock production. The war against deforestation may also turn because of environmental campaigns that may occur at any moment. In February 2017, the report “The ultimate mystery meat: Exposing the secrets behind Burger King and global meat production,” from Mighty Earth, denounced that deforestation for soy production in the Brazilian Cerrado and Bolivian Amazon were associated to two large traders Bunge and Cargill (Bellantonio et al., 2017) whose products feed the cattle that supply the Burger King fast food chain. Additionally, the report demanded that the companies follow the model of the Soy Moratorium. Outlets of the international press reported on the case (example in Tabuchi et al., 2017 and Neslen, 2017), which was followed by protests in front of a Burger King restaurant in São Paulo. In May 2017, the same organization made another accusation that deforestation was continuing in the two regions (Mighty, 2017). In response, the traders pointed out that they have plans established to eliminate deforestation in their supply chains (Cannon, 2017). Also, in April 2017, Greenpeace suspended negotiations with JBS over the Public Commitment by Ranching shortly after operation Carne Fria (Greenpeace, 2017). To improve control, Greenpeace proposed more transparency and publicizing of data, as well as control over the indirect suppliers and blocking ranches located inside Indigenous Lands. Greenpeace also exhorted the three largest supermarket chains operating in Brazil (Carrefour, Pão de Açúcar and Walmart) to fulfill their commitments to zero deforestation. Two months later, Greenpeace suspended its participation in the agreements with all the companies in the sector because of the lack of progress, the revelation of involvement by the controller partners of JBS in corruption and because of backtracking on environmental policies (Greenpeace, 2017a). Greenpeace’s departure from the agreements weakens the credibility of the sector even more. Several promises from the private sector, governments and multilateral agencies against deforestation have 2020 to 2030 as deadlines. That type of commitment is a global tendency because of climate changes and has occurred with other agriculture and livestock activities, electricity generation, mining and others (See examples in Global Witness (n.d.); RE100 (n.d.); SumofUs (n.d.), Greenpeace, 2009a; Carrington, 2016). So far, those measures have had little effect in the field. If the as promises are kept, they may have an effect especially with regard to the largest companies. In 2010, the Consumer Goods Forum-CGF, made up of large international corporations such as Unilever, Walmart and MacDonald’s, promised to achieve zero net deforestation in its supply chain by 2020. The CGF has 400 members with US$ 3.9 trillion in revenues and promised to focus on halting deforestation associated with purchases of soy, palm oil, cellulose and paper and beef (CDP, 2017). The CGF created a public-private partnership in 2012, the Tropical Forest Alliance 2020 (TFA), to support implementation of the promise of zero deforestation through several partnerships (TFA2020, n.d.). In 2014, at the United Nations Conference of the Parties on Climate, the New York Declaration on Forests (NYDF) was approved, which is an international voluntary and non-binding declaration for taking measures to reduce global deforestation. In 2016, those endorsing the NYDF reached 190: 40 governments, 20 subnational governments, 57 multinationals, 16 groups representing indigenous communities and 57 non-governmental organizations (NYDF, n.d.). Among the companies are Cargill, Unilever, Procter & Gamble, McDonald´s, Johnson & Johnson and Nestlé. The Brazilian government is not a signatory, but the states of Acre, Amapá and Amazonas are. The declaration seeks to reduce deforestation by 50% by 2020 and end losses of natural forests by 2030. However, goal two of the NYDF is to support and help the private sector to eliminate deforestation linked to production of agricultural commodities such as palm oil, soy, paper and beef by no later than 2020. In September 2015 another global initiative appeared, The Sustainable Development Goals of the UN, which include halting deforestation by 2020 (United Nations, 2016). Brazil, as a signatory, agreed to annually present a National Voluntary Review on the advances in achieving the goals (United Nations, n.d.). That agreement, although voluntary, is more ambitious than the national policies on climate changes: which determine the reduction of Amazon deforestation to less than 3,800 square kilometers by 2020 and a halt to illegal deforestation by 2030 (referring to the Paris agreement of which Brasil is also a signatory). The annual review to be submitted to the UN will expose the countries that have advanced toward the goals, but the consequences are uncertain. Resolution no. 4.327/2014 of the National Monetary Council and the Central Bank require financial institutions and other institutions authorized to operate by the Central Bank of Brazil to establish and implement the Socioenvironmental Responsibility (PRSA) beginning in February 2015 (Bacen, 2014). If the banks carry out their policies, the effect can be considerable given that Brazil allocates about R$ 200 billion per year in agricultural credit. But there is a risk of the public authority delaying or extinguishing the need for implementing this type of resolution, as it has done with the Forest Code, the reduction of Conservation Units and is trying to do with environmental licensing. In fact, in May 2017 Congress inserted an article in a provisional method that makes it difficult to hold banks liable for environmental crimes associated with partnership contracts (See analysis in ISA, 2017a). Another difficulty in curbing financing for deforestation is that some of the ranchers can get their own funds from the sale of timber from the public forests that they occupy free of charge. Thus, it would be necessary to combat land grab fraud in order to block that source of capital, but the government has recently facilitated regularization of titles to public lands, will certainly encourage new occupations (Rodrigues, 2017). Some Brazilian states have also promised goals against deforestation. In 2015, the government of Mato Grosso promised a 90% reduction in deforestation by 2030 using the 2001-2010 period as a reference (Mato Grosso, n.d.). In 2016, 95.4% of deforestation in Mato Grosso was illegal, although the area assessed by the state agency in 2016 increased more than 50% in relation to the previous year and enforcement by Ibama increased 122% during the same period (ICV, 2017). However, in 2016 deforestation fell by only 6% in Mato Grosso in relation to 2015. The dissuasive power of enforcement was probably weakened by recent amnesties for environmental crimes, such as the change in the Forest Code. In Pará, in 2012, the governor announced the goal of halting net deforestation by 2020 (Pará, 2012). To reduce deforestation and attract investments for sustainable development, the government created the Green Municipalities Program and the Pará 2030 strategy. However, deforestation in the state continues to be high and rose 75% from 2012 to 2016. The case of Pará also seems to show that local plans are insufficient for dealing with market pressures and national plans that favor deforestation, such as the reduction of legal protection and major infrastructure projects that attract immigrants carrying out mitigating measures, such as the Belo Monte Hydroelectric Project (See Barreto et al., 2011 and Mansur, 2017) and paving of the BR-163 highway. Despite the agreements that the Brazilian government has signed (Paris Agreement and Sustainable Development Goals), it seems unlikely that the heads of the Executive and Legislative branches will spontaneously strengthen measures against deforestation – considering their recent history and the budget and political crises and the power of their campaign funders. At the same time, international promises in the medium and long range show insufficient advances (Climate Focus, 2016; GLF, n.d.). For example, a global analysis of 500 companies, investors and governments who can influence deforestation (Forest 500) reveals that those with commitments such as the CGF and the NYDF will not meet them by 2020 or 2030 if the rate of progress recorded up to 2016 is maintained (GLF, n.d.). Of the group evaluated, only 26% of the companies in the ranching supply chain (meat and leather) have policies for dealing with their environmental impacts. Sarah Lake, head of the Supply Chains Program at GCP, which produced the report, states that “many of these commitments lack the teeth to make meaningful change in the sustainability of commodity production” (GLF, n.d.). Most countries that import products linked to deforestation do not have measures that restrict sourcing. Germany and the Netherlands are the only importing countries on the Forest 500 list that support the initiative for importing sustainable raw materials. The forces against deforestation may change if those evaluations of the commitments inspire concrete actions in the short term. For example, eight companies are working with Carbon Disclosure Project (CDP) to collect information from their principal suppliers regarding their management of the risks associated with deforestation (CDP, 2016). The analysis of data from suppliers collected in the pilot year of 2017 will be published in the annual CDP report on the supply chain in January 2018. Among the eight companies are Arcos Dorados, the McDonald’s franchise in Latin America and JBS (CDP, 2017). Besides the CDP, two other tools – Global Forest Watch (n.d.), and Commodities and Transparency for Sustainable Economies (Trase, n.d.) – are being refined to assess the global impact of those agreements over the next two years (NYDF, n.d.). Other repercussions are initiatives for influencing the policies of other countries. For example, in May 2017, FERN, an NGO that seeks to influence European policies that affect forests, released a report suggesting to the European Parliament measures to keep soy imports by the European Union from stimulating deforestation in Brazil (Gregory & Polsterer, 2017). The report was launched in the European Parliament as part of the revision of the European Union’s Common Agricultural Policy, which will be concluded in 2020, and was supported by a German member of parliament who is part of the revision committee (FERN, 2017). To summarize, the success of long-term promises and agreements will depend on steps or benchmarks that are more compelling in the short term – such as punishments and market restrictions if certain goals are not met. Prior experiences show that ranchers and agribusiness respond in a pragmatic manner when pressures and incentives are clear and consistent. Without clear pressure from outside the sector (from the market, society and public agents), it is likely that many meat-packing plants will not assume commitments and that the agreements will not be effectively implemented. Thus, thousands of ranchers in the Amazon would continue to fell and burn forests for raising cattle. The complete list of signatories is available at United Nations (2014). In Brazil, the CDP is supported, since its first edition, by the Brazilian Association of Closed Entities of Supplementary Pension Plan (Abrapp) and the Brazilian Association of Publicly-Held Companies (Abrasca). After we concluded this report, several events exemplified the political and reputation risks of continuing to promote deforestation. Letter from the Minister for the Environment and Energy of Norway. In the letter sent shortly before the visit of president Michel Temer to Oslo, the Minister for the Environment of Norway expressed concern about the tendency towards rising deforestation during the 2015-2016 period. During the visit of Brazilian authorities to the country, the Norwegian government then confirmed that it will follow the rules of the Amazon Fund and reduce the transfer of funds due to the increase of deforestation in 2016 (Angelo, 2017). Domestic and international News reports. Among the news stories that highlighted the reduction of protection areas was one from the Jornal Nacional showing that approval of the provisional measure (MP) would benefit illegal occupations and encourage new deforestation (JN, 2017). After the report, Pará singer Fafá de Belém produced a video demanding that President Temer veto the Project; it soon reached 2 million hits. At the same time The Guardian noted that the Brazilian president is viewed as an ally of the rural lobby, who pressure him for cuts in protecting the Amazon (Carrington, 2017). Manifestations from the private sector. Brazilian and international business leaders have declared that reducing protection in the Amazon may affect the access of Brazilian products to the international market (Calixto, 2017). They point out that environmental legislation is weakened by the loss of protected areas, influencing deforestation rates and also affecting a growing market that demands less polluting activities and more sustainable products. Internet campaigns. Several institutions have collected signatures against the project. Together the Instituto Socioambiental (ISA) and the World Wildlife Fund (WWF-Brasil) have collected almost 31 thousand signatures from persons opposed to the MP (ISA, 2017; WWF-Brasil, 2017). Personalities such as Leonardo DiCaprio and Gisele Bündchen have jointed the voices calling for a veto to the MP (Estadão, 2017). After the veto, President Michel Temer directly responded to model Gisele Bündchen and the WWF with the message: “@giseleofficial and @WWF, today I fully vetoed all of the items in the MPs that would reduce the preserved area in the Amazon” (G1, 2017). However, the Environment minister promised senator Flexa Ribeiro, who led the proposal for reducing the areas, that the project would be resubmitted as a bill with constitutional urgency (ISA, 2017a). The maneuver was immediately denounced by NGOs in a manifesto (Veto para Norueguês Ver?) and was widely reported in the press (ISA, 2017a; Leite, 2017; Bragança, 2017). That situation and the fact that the Norwegian government has confirmed that donations to the Amazon Fund will be reduced due to the increase in deforestation led the Environment minister to retreat and announce that the reduction of the area will be conditioned to a technical report from ICMBio. The outcome of this case is still uncertain, but demonstrates the risk to reputation and business if the companies and the public authority insist on policies that favor deforestation. After a campaign against deforestation, a number of large companies established the Soy Moratorium in 2009, which led to a strong reduction in deforestation associated with this crop – from a 30% increase in expansion of planting before the moratorium to about 1% afterwards (Gibbs et al., 2015). At the same time, soy production rose due to increased productivity and the use of degraded pastures. To achieve that advance the major companies in the sector, coordinated by the Brazilian Association of Vegetable Oils (Abiove), hired independent audits that used satellite images and aerial surveys (Imaflora, 2017). The success of the initiative led to the moratorium being maintained over the last ten years and beginning in 2016 it was kept in effect for an indefinite period (Greenpeace, 2016). That path is also plausible with ranching, since it is possible to increase production without deforestation, as demonstrated in the analyses of Barreto & Silva (2013) and Strassburg et al. (2014). The lack of control of foot-and-mouth disease kept most Brazilian states from exporting fresh beef up to 1998 (Naranjo and Cosivi, 2013). To open up the market, state, municipal and federal governments and the private sector (ranchers, associations, federations and the confederation) organized to control the disease by vaccinating the entire herd. Given the complexity of the problem, the National Program for Eradicating and Preventing Foot-and-Mouth Disease (Pnefa) established goals and deadlines, according to the Terrestrial Animal Health Code, established by the World Organisation for Animal Health (OIE), and zones for moving forward with control (Lima et al., 2005; Aeapa, 2006). The commitment was so clear that it even established that the private sector should mobilize “financial resources and political influences to maintain the program” (CRPBZ, 2016). In 1998, the first zone free of foot-and-mouth disease in Brazil was recognized, made up of two states that together accounted for about 10% of the herd (Figure 1). The control advanced rapidly, but cases of the disease were recorded in 2001 and 2005, which reduced the percentage of the clean herd (Figure 1). Those cases threatened the economy and closed markets. The work continued, and 2016 was the tenth straight year without recorded foot-and-mouth disease in Brazil. As a result of the collective effort, from 1998 to 2014 control grew from 10% to 98% of the herd (Figure 1) and enabled Brazil to increase exports from 5.7% to 21.7 % of production with an additional revenue of U$ 5.5 billion (Pnefa, 2014; IFNP, 2000 to 2015). In 2017, Roraima was declared free of foot-and-mouth disease throught vaccination by the Ministry of Agriculture, Ranching and Supply (Mapa). That recognition allows the sale of animals from all states in Brazil, except Santa Catarina, the only state classified as free of foot-and-mouth disease without vaccination. The next step is to seek international recognition (OIE) so that the state can also export live animals to other countries (Portal Brasil, 2017). With the update in the status of Roraima in 2017, only two states (Amapá and Amazonas) are still in the zone classified as infected, besides a small zone in the state of Pará (Figure 2) that borders those states and is classified as a buffer or protection zone (Pnefa, 2017). The zones were declared free considering that the disease had not occurred for a period greater than two years, there was no evidence of the presence of the virus causing the disease for at least the last 12 months and there was surveillance to detect the incidence of the virus. The ID column follows the identification of Figure 6. The * beside the ID indicates units interviewed. The operational status reflects the data collection period, which was February to April 2016. We estimated the pasture area necessary for supplying the maximum installed slaughter capacity of the meat-packing plants registered with the SIF and SIE. 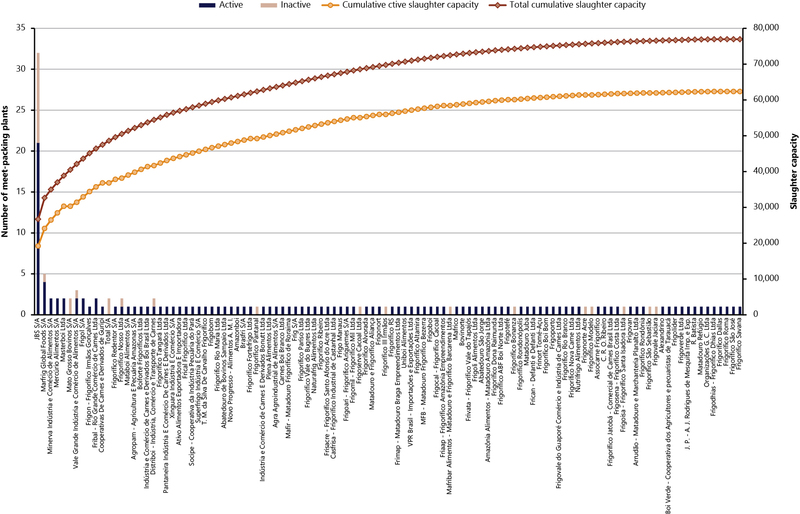 We obtained the data on slaughter capacity through interviews with representatives of 40 meat-packing plants. We then used those data to estimate the capacity of the remaining plants, considering the classification attributed to the meat-packing plants by Mapa (SIF), or used the average of the meat-packing plants registered with SIE by state. With the maximum daily capacity established, we used the total number of work days (254) in 2016 to estimate the demand of animals for slaughter per year of all the companies individually and in total. Next, we estimate the total of animals needed to meet the demand according to the average daily slaughter rate per state from 2013 to 2015 (Table 1). The slaughter rate is the percentage of the total of cattle slaughtered during the year. Using a rule of three, we estimate the total of cattle that would need to be in the pastures. We divided the total of cattle by the average stocking rate of pastures in the region (1.26 animal per hectare, according to Dias-Filho, 2014) to find the pasture area necessary to supply the installed capacity of the meat-packing plants in the Brazilian Amazon. For example, we estimate that approximately 68 million hectares of pasture would be needed to supply the entire slaughter capacity of the meat-packing plants registered with the SIE and SIF active in 2016. Later, we compared the total pasture area needed by categories of meat-packing plant with the total area existing in 2013- 2014 (61 million de hectares). Therefore, the area necessary for supplying the installed active slaughter capacity would be a pasture area 13% greater than what existed in 2014 (Table 2). If all the meat-packing plants were active and operating at total capacity, an area of pasture 46% greater would be necessary. We estimated the areas of remaining forest in the Amazon that would be at the greatest risk of deforestation from 2016 to 2018. To do that, we considered that someone who deforests takes into account factors that affect the potential success of using the area, such as the slope of the land, the distance from market for agriculture and ranching products (e.g. meat-packing plants) and the availability of transportation (distance from roads and navigable rivers). It is thus possible to estimate (or project) the risk of future deforestation in a given forest considering its location in relation to the factors that are historically associated with deforestation. To estimate what areas would be at greater risk of deforestation in three years, we would need to estimate how much would be cut in that period. A precise estimate is difficult, because many variables are unknown, for example, if the government will intensify enforcement. Therefore, to simplify the analysis, we consider that the rates for the next three years would be similar to those of the last three years. We know that this assumption provides no certainty regarding the future rate, but does serve to indicate areas that deserve more attention from efforts at containing deforestation. To predict the areas at risk of deforestation, we first quantify the remaining forest in the Amazon. The next step consisted of calibrating the model – in other words, analyzing the significance and weight of factors that have encouraged or discouraged deforestation in the recent past (2009 to 2014), such distances to roads, meat-packing plants and Conservation Units. Later, we calculated the probability that remaining forests would be deforested considering the closeness of those factors. Finally, we estimated the forest areas at greatest probability for deforestation, assuming that those areas at greatest risk would be deforested first, until reaching the total that had been deforested over the last three years – in other word, 17 thousand square kilometers. We next present the data and procedures for this analysis. Quantify the remaining forest. 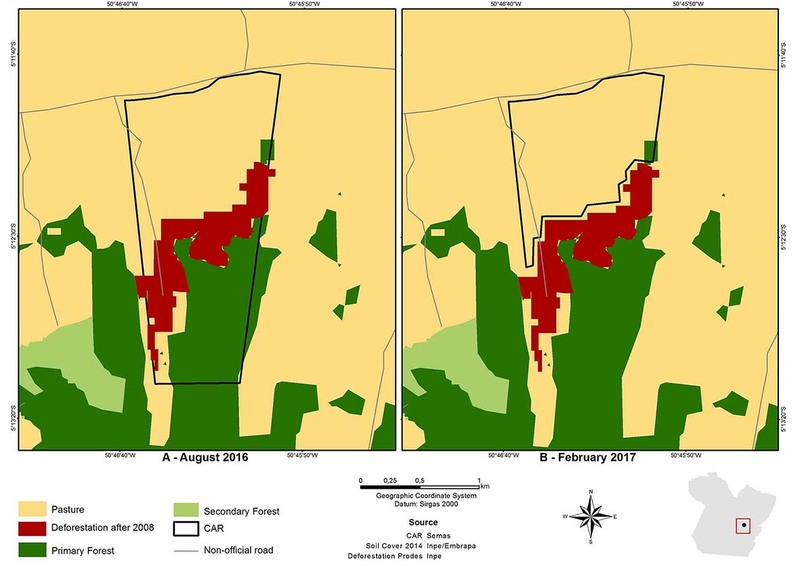 The purchasing zones of the meat-packing plants were combined with historical deforestation data generated by the Satellite Forest Monitoring Project (Prodes), National Space Research Institute (Inpe), resampled for 1 km x 1 km pixels. The objective of that analysis was to quantify the remaining forest available in each zone of the meat-packing plant, besides describing the historic deforestation rates by zone (Figure 1-C). Estimate the areas at risk of new deforestation. We used Land Change Modeler, available in the TerrSet program (version 18.31), to estimate the risk of deforestation of forest remnants. The program calculated the risk by evaluating the association of deforestation occurring from 2009 to 2014 with maps for elevation and slope of the land, distance from rivers, from old deforestation, from recent deforestation, from non-military areas, from protected areas, from roads, from Incra settlements, from military areas, from meat-packing plants and from areas embargoed by Ibama (Figure 2 and Table 1). Distances were calculated using the Distance model of the IDRISI program. To calibrate the model, we used the Relevance Weight (RW) method (Sangermano et al., 2010), which estimated the importance of each variable to generate the deforestation risk map. The RW consists of comparing the standard dev change with the standard deviation of the same variable generated at the Amazon scale. For each one of the annual variables from 2009 to 2014 we calculated the RW of each variable utilized in the model (Figure 2). The variables with values close to 1 demonstrate high importance for the model. The variables close to zero demonstrate low importance. The most important risk factors included distances to areas with recent deforestation, to non-military areas and to areas with deforestation, settlement, Protected Areas and distance to meat-packing plants (Figure 3). Project the areas at risk of deforestation. The projection occurred in four stages. 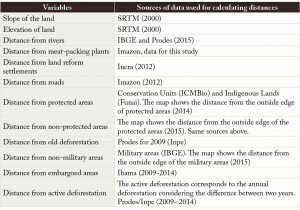 First, we estimate what variables are more associated with deforestation comparing year by year 2009 to 2014 (Figure 4 A and B). That map made it possible to generate the maps for transition potential that show the regions with more or fewer characteristics of occurrence of deforestation comparing the passage from one year to the next (Figure 4 – C). Later, we combined those maps and calculated the average transition value from 2009 to 2014 (Figure 4 D), which is the average risk map. With the risk map (Figure 4 D), we used the TopRank module of the TerrSet program to project the parcels of forest at greater risk of being deforested in the future (Figure 5). That module selected and totaled the regions with the greatest probability of reaching the projected 17 thousand square kilometers. The data are presented in growing order of the ranking of deforestation 2010-2015. In response to the ranching agreements for zero deforestation in the Amazon, some companies have developed tools for showing consumers the origin of the cattle. The models range from a list of ranches to certified and audited information with characteristics of the ranches. In 2014 Mafrinorte (Ativo Alimentos) had a tool for traceability on its site (Figure 1A), in which one could select the year, month and date to verify the supplying ranches, but it seems that the tool has been discontinued, because it no longer provides the current data, nor for previous years (Figure 1B). Marfrig maintains a site (https://rastreabilidade.marfrig.com.br/GadoLegal/) providing access to the list of its suppliers (Figure 2) by inserting the SIF number of the plant and the slaughter date, but it only provides the name and municipality of the plant, without giving its geographical coordinates. JBS S/A has two mechanisms for the consumer to verify origin of the animals: i) The QR code, a code located on packages of the company’s brand allowing the list of suppliers to be accessed using smartphones; and ii) a site (http://www.confiancadesdeaorigemjbs.com.br/), through which a consumer can access the list of suppliers by inserting the SIF number of the producing plant and the slaughter date (Figure 3A). On the list, next to de name of each supplying ranch, there is an icon, that when clicked on, shows the geographical coordinates of the ranch, as shown in Figure 3B. For the consumer, what is more useful is certified information with quality of the origin – e.g. the tracking system developed by Safe Trace that traces the origin of the cattle with a chip or tag, storing the genetic, sanitation and management history, updated with a software (Aranha, 2015). Retail networks such as the Pão de Açúcar Group (GPA), are using that system to track the origin of beef and promise to, in the short term, have 100% of their beef tracked, considering animals from birth to slaughter. Figure 3. Example of list of suppliers of a JBS packing plant (SIF 1110) accessed on 22/07/2016 (A); and geographic location of Fazenda Terra Nativa, in Santana do Araguaia (PA), obtained by clicking on the locator of the origin on the JBS site (B). The point coordinates are 9°34’37.8”S+51°09’39.2”W. In March 2017 Ibama carried out operation Carne Fria to crack down on raising and sale of cattle coming from areas embargoed due to illegal deforestation and, when it was found that animals had been acquired from those areas after their vegetation had been suppressed, the buyers of those animals were held liable as established by Federal Decree no. 6.514/2008. According to Ibama, the operation “is part of one of the lines of action of the monitoring and control theme of the Action Plan for Preventing and Controlling Deforestation in the Brazilian Amazon (PPCDAm), created in 2004. PPCDAm is one of the instruments of the National Policy on Climate Change and its objective is to continuously and consistently reduce deforestation, as well as to create conditions for a model of sustainable development in the Brazilian Amazon” (Ibama, 2017a). To discover the violations, Ibama crossed information on embargoes made by the institute with data from the Rural Environmental Registry (CAR) and the Animal Transport Permits (GTA), which control the transport of cattle between the ranches and from them to the meat-packing plants. The CAR data were obtained from the State Secretariat for the Environment and Sustainability of Pará (Semas) and the National System for Rural Environmental Registry (Sicar), including georeferenced information on the property and identification of the owner. Ibama confirmed the use of the embargoed areas by visiting and overflying the ranches. The GTAs were obtained after a request made in 2014 to the Agency for Agriculture and Livestock Defense of the State of Pará (Adepará), through the Federal Public Prosecution Service (MPF), and to the meat-packing plants in the south, southeast and west of Pará in 2016, through a notification. The crossing of data from the ranches of origin of the cattle with data from the embargoed ranches allowed Ibama to track the cattle from ranch to meat-packing plant/exporter and identify the direct and indirect irregular sources. The direct sale occurs from the fattening ranches who sell the cattle directly meat-packing plants/exporters. The indirect sources are the ranches under embargo (irregular) who raise the cattle and sell or transfer them (calves, bullocks or adult cattle) to fattening ranches (regular or irregular), who for their part sell to the meat-packing plants/exporters, in a scheme called “laundering” or “heating cattle” (falsifying documentation). During the investigation Ibama identified two laundering schemes used to hide the origin of cattle and, thus, to not violate the agreements signed with MPF and/or Greenpeace. In the first, the rancher would raise the cattle in embargoed areas, but use GTAs with the name of regular ranches to sell and transport them to the buyer meat-packing plants/exporters. In the second scheme, the rancher would raise the cattle in embargoed areas next to regular ranches, transfer and mix them with animals legally raised on those ranches and then sell them as if they were legal (Locatelli & Aranha, 2017). Finally, Ibama discovered transactions involving cattle between rural properties and embargoed areas (Ibama, 2017a). Those schemes show the failings of the agreements – which establish monitoring only for the direct origin of cattle sold to meat-packing plants/exporters, but keep the indirect origin unknown – and do not require development of a means for verifying the origin of animals during their entire life cycle. There are cases of cattle leaving ranches under embargo and going to fattening ranches and later to meat-packing plants/exporters in a single day. According to Ibama, Carne Fria is not related to operation Carne Fraca, begun three day earlier, on March 17, by the Federal Police. 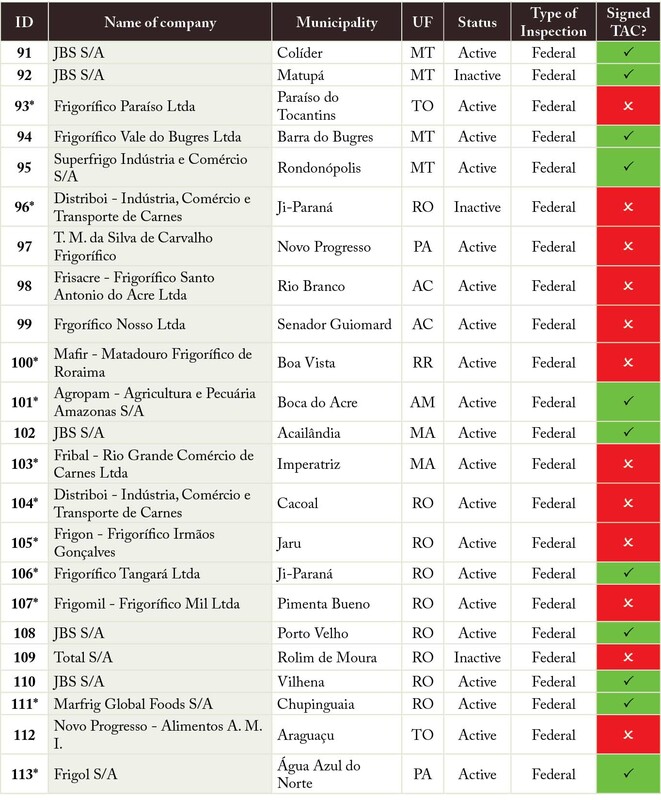 During the operation, Ibama interdicted 15 meat-packing plants in the states of Pará (11), Tocantins (3) and Bahia (1), one exporter of live cattle (Pará) and 24 ranches in Pará with areas embargoed by Ibama due to illegal deforestation (Table 1) (Ibama, 2017a). The meat-packing plants and the live cattle exporter were accused of violating the TAC for Beef signed in 2009 by acquiring directly or indirectly (through intermediary ranches where their illegal origin was “laundered”) 58,872 head of cattle raised on 50.7 thousand hectares embargoed in Pará and selling them for the amount of R$ 130.8 million (Table 2) according to the value per established by the State Treasury Secretariat of Pará (Sefa), equivalent to approximately 14,719 tons of processed meat (Ibama, 2017a; Corrêa, 2017). In Pará, meat-packing plants were interdicted in the municipalities of Redenção, Santana do Araguaia, Tucumã, Rio Maria and Xinguara (Figure 1). The JBS S/A company was the main target of the operation, with two meat-packing plants, one located in Redenção-PA and the other in Santana do Araguaia-PA. JBS S/A was accused of acquiring 49,438 head of cattle from embargoed areas, equivalent to 84% of the total involved in the action, and fines totaling R$ 24.7 million (Ibama, 2017b; Locatelli & Aranha, 2017). Besides interdicting the meat-packing plants, Ibama embargoed the purchase of new animals and made their release conditional on confirmation of their origin. 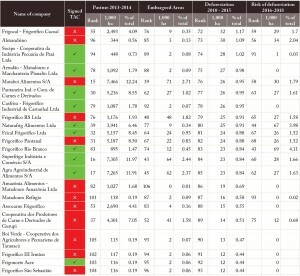 As for the 20 ranches under embargo, all in Pará, they were accused of violating the embargo (usage for pasture) due to impeding the regrowth of native vegetation (18 of them presented in Table 3) in those areas and/or sale of live cattle raised in the embargoed areas (24 properties). They are situated in the Pará municipalities of Cumaru do Norte, Santana do Araguaia, Redenção, São Félix do Xingu and Bannach. Approximately 43% of the cattle were indirectly bought from the embargoed ranches; and the average percentage of the total area of the ranches embargoed is significant: 38% (Table 4). Overall, there were 172 notices of violation, totaling R$ 294 million in fines (Ibama, 2017b). Ibama requested access to documents for moving cattle and to the System for Integrating Agriculture and Livestock (Siapec), which controls the GTAs (Ibama, 2017b). This total differs from what was presented in a note that Ibama released to the press (R$ 294 million). We were not able to obtain an explanation from the agency about that difference. This number is lower than the one reported in the Ibama note to the press, which totaled more than R$ 28 million. We did not obtain the information from Ibama about that difference in time. Besides the fines, Ibama also recommended that other agencies take action. For the MPF in Pará Ibama suggested: i) execution of the sanctions established in the TAC for Beef on the signatory meat-packing plants that demonstrably violated the agreement by purchasing cattle from embargoed areas; ii) a Civil Public Suit demanding that those meat-packing plants repair the environmental damages, which shall be assessed based on the area under embargo utilized during the 2013-2016 period; and iii) the demand for a “judicial collateral” in the amount of R$ 130,807,290, referring to the equivalent to the 58,177 head of cattle acquired by the meat-packing plants should the meat processed/produced from animals acquired from the embargoed areas have already been sold. From Semas, Ibama requested an analysis of the list of suppliers of cattle presented by the JBS Redenção meat-packing plant, according to the annual demand provided in the environmental permit, in order to verify and confirm its legal origin. From Adepará, Ibama demanded i) effective control over the production chain, with integration of the environmental management systems (Sicar, Simlam, Sigam, Lists of embargoed areas) with Siapec; ii) definition of norms/procedures, analyses routines and field verification that validate rural production areas that meet environmental requirements in order to supply bovines to the meat-packing plants; and iii) providing Ibama full access to Siapec, in order to appraise the production chain of cattle and continue to verify the regularity of the rural properties that supply the meat-packing plants. There was a strong and immediate reaction from politicians and rural producers to neutralize the operation. The federal, state of Pará and Xinguara municipal governments, and representatives of the ranching class in the state harshly criticized the approach utilized by Ibama in the operation, which they called untimely, arbitrary and other things. They challenged the methodology of the investigation, considering it inappropriate, pointless and truculent, and defended the meat industry in Pará, praising its efforts at regularity and its importance to the economy (Pegurier, 2017; Poder360, 2017; Nunes, 2017; Ambiente Inteiro, 2017; Diário online, 2017; CT Online, 2017; Ramos, 2017). According to the site O eco, the reaction of the Presidential Palace, in Brasília, when learning of the operation, was to try to suppress its dissemination at the national level by twice stopping the president of Ibama, Suely Araújo, from calling a press conference to announce the operation (Pegurier, 2017), which was denied by the institute. Also, according to O eco, that happened because not even the Ministry of the Environment was informed about the operation. In a video, minister Sarney Filho affirmed that the MMA had not been informed by Ibama about the operation, even though the institute is part of that ministry, and although he was not opposed to operations that promote legality, the moment was not opportune for carrying out the operation given that the agriculture and livestock sector, so important to the Brazilian economy, was already weakened because of Operation Carne Fraca, launched by the Federal Police three days earlier (Poder360, 2017). The vice-governor of Pará, José da Cruz Marinho, considered the operation to be “an undue interference by Ibama in the state’s jurisprudence,” given that the legislation already delegates the state powers to conduct and legalize productive activities in its. He furthermore said that Prodes, used in the investigations to map deforestation on properties, is a regionalized deforestation mapping system, and is thus imprecise for mapping at the property level (Nunes, 2017). In the Pará State Legislative Assembly (Alepa), the representatives unanimously approved a vote repudiating Carne Fria, which, according to assembly president Márcio Miranda, “was not against Ibama fulfilling its duties and doing enforcement, but against the way the operation was carried out” (Ambiente Inteiro, 2017). Representatives Gesmar Rosa (PSD) and Sidney Rosa (PSB) also spoke out defending production in the state and defining the method used by Ibama in the operation as “truculent” (Pegurier, 2017). In a meeting with the environmental minister and the president and directors of Ibama to deal with the repercussions of Operation Carne Fria, Pará state government secretaries, Pará members of congress, entities and companies in the state’s meat business defended the environmental regularity of the beef industry in Pará (Agência Pará, 2017). The extraordinary secretary of the State Green Municipalities Program, Justiniano Netto, alleged that the beef industry has done a serious job and adhered to the TAC and, because of that, did not deserve the treatment received during the operation. He also affirmed that the embargoes had proven to be disproportional and senseless, so much so that Ibama soon reviewed some of the embargos and the Justice system granted an injunction; and that the operation was totally unfocused, because it considered old deforestation, from more than ten years ago, as well as trying to hold meat-packing plants liable for not using information that is not available in Ibama’s public systems (Agência Pará, 2017). Speaking for the ranching sector, the Rural Producers’ Association of Xinguara also strongly criticized the methodology adopted in the operation. According to its president, Joel Lobato, who is also director of the Pará Federation of Agriculture and Ranching (Faepa), “the general complaint is that there were no charges, demands for documents or for information on the methods used by the meat-packing plants to monitor the origin of the cattle they buy” (Diário online, 2017). The municipality of Xinguara, through its mayor Osvaldo de Oliveira Assunção Júnior, also expressed himself by publishing a protest note “expressing his highest solidarity with the representatives of the meat industry, rural producer associations, business leaders, ranchers and rural producers in general, in the lamentable episode of the Ibama embargo of the meat-packing plants in our region, which paralyzed the entire productive chain of the meat industry in southern Pará” (CT Online, 2017). The called on ranchers, meat-packing industry representatives, rural producers, political and community leaders in agribusiness and authorities in general in southern Pará to a meeting to outline goals, guidelines and strategies for reacting to the problem that has hit the regional economy (Ramos, 2017). After the interdiction of the meat-packing plants on March 22, agribusiness leaders held meeting in Belém and Brasília to try to reverse the situation. After meeting with Pará authorities, the Ibama presidency announced that all of the meat-packing plants would be cleared and could function normally as of March 23, one day after the interdiction, under the condition that the companies present their suppliers (Corrêa, 2017). Seven meat-packing plants and one exporter of live cattle requested suspension of the embargoes, either judicially or administratively, and obtained a favorable preliminary decision. The fines totaled R$ 9,544,500 for the acquisition and sale of 55,098 bovines obtained from embargoed areas, that are respectively equivalent to 99% of the total in fines for those infractions and 94% of the number of head of cattle accounted for all of the meat-packing plants fined in the operation. The Mercúrio Alimentos S/A, Rio Maria S/A and Stop Carnes meat-packing plants and the live cattle exporter Agroexport Trading and Agronegócios S/A filed a request for suspension of the embargo with Ibama, presenting documents that, in principle, confirm that the provisions expected for March were not associated to the rural properties embargoed by the institute, according to the conditions of the institute itself established at the moment of the embargo. After analyzing the documents, Ibama issued Interlocutory Decisions (DI) – meaning partial decisions that do not end the process – suspending the embargoes, with specific determinations to each one of the appellant companies and determining to all that “within ninety days be presented solution, which, effectively absolutely inhibit the acquisition of animal products and byproducts produced in an area under embargo, to strive for legality in the business of the entire productive chain involved” (Interlocutory Decision MMA-Ibama no. 209/27 of March 2017 – SEDE/NUIP; Interlocutory Decision MMA-Ibama no. 208/27 of March 2017 – SEDE/NUIP; Interlocutory Decision MMA-Ibama no. 224/04 de April 2017 – SEDE/NUIP). The list of embargos and respective procedures is available at <http://bit.ly/2p0rHhD>. Five meat-packing plants in Pará appeal in court for the suspension of embargoes of their plants by Ibama: JBS S/A (plants in Redenção and Santana do Araguaia), Mercúrio Alimentos S/A (Xinguara), Frigorífico Rio Maria (Rio Maria) and Xinguara Indústria e Comércio (Xinguara). The five meat-packing plants affirmed, among other things, that they controlled their suppliers and sourced cattle only from regular areas and, thus, were following the TAC signed in 2009. Judge Heitor Moura Gomes of the 2nd Court of the Marabá Judicial Subsection (PA) lifted the embargo on all the meat-packing plants alleging, among other things, that “[…] the quantity of cattle supposedly acquired from an embargoed rural property is insignificant compared to the volume of cattle acquired/slaughtered by the claimant over these last few years […]” (Vargas, 2017). The administrative and court cases will continue regarding the merit of the fines. In response to the request from Ibama to MPF to bring a court case to charge the meat-packing plants – in case the beef processed/produced from animals bought from the embargoed areas had already been sold – a “judicial collateral” of R$ 130,807,290 referring to the equivalent to the 58,177 head of cattle sourced from irregular areas by the meat-packing plants, Federal Prosecutor Daniel César Azeredo Avelino, of MPF, by e-mail on May 22 2017, informed that the MPF is awaiting the written justification of the companies before deciding on those recommendations. There were few reactions supporting the operation. The journalist and environmental activist André Trigueiro, in a comment to radio CBN, defended the operation noting that Carne Fria should not be eclipsed by operation Carne Fraca, carried out by the Federal Police three days earlier (globo.com, 2017). The journalist harshly criticized as a “complete aberration,” the ruling by the federal judge in Marabá-PA, that lifted the embargo on JBS S/A by considering that the number of cattle bought by the company coming from embargoed areas was tiny if compared to the 2 million head for slaughter that since 2012 had been sourced in a completely legal manner by JBS S/A (globo.com, 2017). The environmental NGO Greenpeace reacted to the operation by suspending negotiation with JBS S/A related to implementation of the Public Commitment by Ranching in the Amazon, in existence since 2009. In the agreement, JBS S/A commits itself to excluding ranches involved in deforestation, slave labor, and invasion of Indigenous Lands and Conservation Units from its list of suppliers. Lifting the suspension was made conditional to confirmation that the beef sold is fit for consumption and free of deforestation, slave labor and conflicts with Indigenous Lands and Conservation Units (Greenpeace, 2017). According to Greenpeace (2017), the operation “reveals the frailty of the control systems and the need for expanding social control over the ranching production chain, with more transparency and public access to data that are relevant to society. Since 2007, the federal government has been announcing greater control over the cattle export chain, especially for export, with adoption of an electronic GTA and its integration with Sisbov (Service for Traceability of the Bovine and Buffalo Production Chain), but that has never happened.” (Greenpeace, 2017). To improve control over deforestation related to ranching production, Greenpeace proposed new criteria that seek to improve control over transparency and publicity for data, as well as indirect suppliers and blocking for ranches located inside Indigenous Lands. Greenpeace also called on the three largest supermarket chains operating in Brazil (Carrefour, Pão de Açúcar and Walmart) to meet their commitments to Zero Deforestation. However, as this report was being concluded, none of the actors had announced new measures. Starting with a suggestion from the government of Pará, the MPF called a meeting of representatives of the ranching chain, state and federal authorities to discuss improvement in environmental monitoring and control of ranching. In the meeting that occurred in Brasília on April 25, 2017, companies that provide consultancies to TAC signatories demonstrated that there are technologies to provide monitoring and even traceability for purchases. However, the tracking of indirect suppliers would depend on making available data such as GTA or the adoption of other technologies for individual traceability of cattle. The lack of validation for CAR was also indicated as a problem, since there is considerable overlapping of data. The available technologies allow the registration of fraudulent boundaries in CAR. It is relevant to note that the group did not decide about adopting methods for controlling indirect suppliers, especially with the lack of a decision on making the GTAs available. Two institutions that are essential for controlling GTA were not present: Mapa was not invited and Adepará was invited, but did not show up. The group decided to set up a working group involving state and federal environmental authorities to assess the unified procedures for monitoring and enforcing the TAC. Jair Schmit, director of the Department of Forests and Combatting Deforestation will be the focus point for the federal government in managing the ranching TAC. The operation focused on relevant problems, these being control of the indirect origin of cattle and laundering. The embargoes might force quick decisions to avoid irregular purchases. However, the Strong reaction from politicians and ranchers and the judicial and administrative decision for lifting the embargo weakened the potential for immediate direct impact by the operation. The political reaction was expected given the economic relevance of the sector and very probably by the power of influence in politics that was recently revealed by the confession of the controller partners of JBS S/A and of one of its executives . At any rate, two outcomes of the operation may have area impact on the sector and deserve to be monitored. The first is the demand by Ibama that the companies in ninety days present solutions for guaranteeing the legality of the entire supply chain. It is not yet certain if that decision will be maintained, since it may be submitted to revision in the administrative procedures. Second, the Ibama recommendation for the MPF to execute the sanctions provided in the TAC against the meat-packing might have a short-term impact, given that the TAC can be extrajudicially executed. Therefore, the effect of the operation in the short term will to a large degree depend on the decision by MPF. Because this was the main operation for enforcing compliance with the TAC, its repercussions may be the indicator of the success or failure of that mechanism for assigning liability to offenders. The leniency agreement of the director of Institutional and Government Relations at J&F (the main holding company of JBS) and its controller partner illustrates the power of influence held by the agriculture and livestock sector. According to a report by Rodrigues et al. (2017), the director confessed to having made “hidden payments” to the campaigns of 1,829 candidates in the 2014 elections, of which 179 were elected state representatives in 23 states and 167 federal representatives, from 19 parties. He further confessed to paying “bribes to 16 elected governors and to 28 Senate candidates who were seeking election, reelection or election as governors.” According to him, such payments created a “reservoir of good will.” “It was so they wouldn’t get in our way,” he stated. Since 2014, a JBS, Marfrig and Minerva, companies that signed the public commitment with Greenpeace, have made public the results of independent audits made to test their systems for purchasing cattle from the direct supplying ranches (fattened cattle) in the Amazon biome. The auditors verified if there was purchase of cattle from areas with deforestation occurring after October 2009, with embargoes on the Ibama list, with the practice of slave or degrading labor observed on the MTE list, originating from Indigenous Lands and Conservation Units and/or from property grabs that involved land conflicts. To test compliance with the rules, the auditors verified 10% of the total of purchases made in a period of one year. Furthermore, they simulated purchases with qualified and non-qualified properties in the systems of each company. The auditors also verified the records of the companies contracted by the meat-packing plants to do control of purchases, including verification of overlapping of ranches with deforestation recorded by Prodes with Indigenous Lands and Conservation Units. The risk resulting from the lack of traceability. The audits found that JBS and Minerva do not adopt any system for verifying the indirect suppliers (breeding and rearing ranches that sell to the fattening ranches). JBS supports the Novo Campo Program in Mato Grosso, whose initiatives include developing a system for following up the indirect suppliers, but it is still a pilot project (See data on Pecsa in Appendix 10). As for Marfrig, according to the audit report, it asks the direct suppliers to inform the origin of the animals that were bought from other ranches, including data on the property, the municipality, the state, the name of the owner and the CNPJ or CPF. Marfrig then verifies if the indirect suppliers are on the Ibama embargo and the slave labor lists. However, according to the auditors, Marfrig does not verify those ranches in a systematic manner, since the company is not yet able to adopt auditable procedures that will affect those suppliers (DNV GL, 2016). Besides those limitations, the audits of the three meat-packing companies reveal the vulnerability of companies to buying cattle that are being “laundered.” That happens because the purchasing system can “unembargo” a rancher if he (or she) has other ranches besides the embargoed area. With that procedure, the meat-packing plants can buy cattle from the areas without embargoes. However, because there is no traceability or because the system for verifying third parties is still fragile, the cattle bought from area without an embargo may have been raised on the embargoed ranches of the same owner. As unidades que compraram do bioma Amazônia em 2015 e que não foram incluídas na auditoria por estarem fechadas em 2016 estão localizadas em Amargosa-BA, Ariquemes-RO, Cuiabá-MT, Iguatemi-MS, Matupá-MT, Rolim de Moura-RO e São José dos Quatro Marcos-MT (BDO, 2016). Sustainable Ranching of the Amazon (Pecsa) is a company investing to achieve sustainability for ranches in the region. To that end, it seeks to make the entire productive chain free of deforestation, through long-term partnerships with ranchers involved in self-reproducing and fattening the animals. For the company, it is a legal obligation to assure legal sources of cattle suppliers (including raising), since the productive chain is legally co-responsible. To understand the participation of ranchers in the entire ranching chain, Pecsa accesses the GTA, which informs the movement of the animals, indicating their origin and destination, and the names of their owners. That information makes it possible to identify if some property or animal owner has environmental restrictions. The use of the information contained in the GTA was successfully tested on the pilot ranches, and the results were presented to JBS, McDonald’s and in workshops. The implementation of control over indirect suppliers by Pecsa has been monitored by the Instituto Centro de Vida (ICV). The ICV keeps deforestation post-2008 updated, producing maps that combine recent deforestation with property limits. Members of Pecsa use those maps to verify the situation of suppliers before purchasing cattle. When the map indicates that a new supplier presents deforestation post-2008, that supplier is informed of the need to reforest, so that it can sell in the area under the scope of Pecsa. And in cases where there is no deforestation post-2008, Pecsa establishes a new commercial relation and the new supplier has its data included in the Terras – Novo Campo platform. With that, all the cattle sold by ranches participating in Pecsa are registered in the platform, which uses the Ecotrack tool, of the Terras – Novo Campo platform, which enables constant monitoring of the entire chain (direct and indirect) by ICV in order to guarantee zero deforestation. To assure that all of the animals monitored are in fact coming from areas free of deforestation, an audit is periodically carried out, which uses GTA data from all participating ranches to verify if all the commercial activities correspond to those registered with the platform. Currently, Pecsa has a partnership with six ranches for rearing and fattening cows, which total 9,725 hectares. On those ranches 18 thousand head of cattle are being raised. When the intensification is completely implanted, within 1.5 years, they will be 33.4 thousand head (3.4 per hectare). Additionally, Pecsa works with 68 suppliers, with ranches totaling 91 thousand hectares, of which about 50 thousand hectares are pastures. On those ranches for cattle-raising there is around 0.8 cow (breeders) per hectare, thus totaling about 40 thousand breeders. Information obtained from Laurent Micol, director for Governance and Investments at Pecsa. Since 2013 The Nature Conservancy (TNC), in partnership with Walmart and Marfrig, has been developing the project Sustainable Beef: from the Ranch to the Table to promote sustainable ranching development in the region, with greater productivity and better use of degraded pasture. The project, begun in the municipality of São Félix do Xingu-PA, is in its second phase and there are plans for expanding it to other municipalities in Pará and Mato Grosso. Initially, 16 rural producers were selected for the pilot project, which covered 46 thousand hectares, with potential for slaughtering 500 animals per month and supplying 70 tons of meet every month to supermarkets (Baggio, 2016). Later, the project provided information, technical support and investment to participating properties, of different sizes and layouts. The first results showed a productivity increase of approximately 54% among participating properties, with adoption of techniques such as pasture rotation. But there was still the challenge of reaching the entire ranching value chain. To that end, methods were developed to expand traceability for animals, so that partner companies and consumers can be sure that the meat consumed comes from properties that did not have their forests cut down. In that stage data were shared from producers involved in the direct and indirect supply of animals (such as the GTA); and on some properties, “earrings” with chips were implanted in the animals and data from the “earrings” or the GTA were crossed with CAR. With those measures it was possible to verify the origin of the animals before reaching the fattening ranch (or direct supplier). Information obtained from Francisco Fonseca, coordinator for Sustainable Production at TNC, on February 1, 2017. The pilot audit of the TAC carried out in Pará in 2014 revealed the possibilities for leakage and laundering of cattle. When those results were presented to the signatories to the agreement, they suggested to the MPF in Pará that Adepará only issue GTAs for cattle from ranches that were registered in CAR in order to avoid trade in cattle from irregular areas. To meet that demand, in May 2014 the state government published the decree that required Adepará to issue a GTA only to ranches registered in CAR, according to a calendar: i) beginning in June 2014 for interstate operations; and ii) for in-state operations, beginning on a date to be defined in August 2014 by the Steering Committee (Coges) of the Green Municipalities Program (PMV). However, that calendar was only established in April 2015 (Table 1). It had as a parameter the number of head in the herd and the location of the ranch and emphasized municipalities that were a priority for controlling deforestation. Despite the efforts of those involved and the announcement of the linkage between the GTA and CAR by the president of Adepará in March 2016, the decree was not implemented. During the 21st meeting of the PMV Steering Committee, an Adepará employee attributed the delay in carrying out the decree to deficiencies in the technological infrastructure existing in the agency, which led to difficulty in integrating the System for Integrating Agriculture and Livestock, of Adepará, and Simlam, of Semas (today replaced with Sicar-PA). With the non-achievement of the link between GTA and CAR, the MPF sent two recommendations to Adepará in 2016. The first, in July, determined the delivery, within 15 days, of the GTAs issued in all Pará municipalities and of copies of rental contracts and contracts for purchase and sale of rural properties, as well as access to all the movement of GTAs between rural properties and buyers of cattle slaughter and export of live cattle and full access to the data contained in Siapec. Those data were used by Ibama for the analyses that resulted in Operation Carne Fria (See Appendix 8). The second recommendation, sent in September, ordered compliance within 60 days, with Decree no. 1,052 of the state of Pará regarding the obligatory nature of GTA-CAR integration. As a result, in October 2016 Semas and Adepará issued Joint Normative Instruction no. 01/2016 with new deadlines to make issuance of the GTAs conditional on confirmation of registration in CAR according to the calendar in Table 2. Decreto nº. 1.052/2014. Diário Oficial do Pará. Recomendação nº 01/2016 – GAB02/PRM/ALTAMIRA-PA.
 Recomendação nº. 189/2016 – GAB10/PR/PA. IN Conjunta Semas/Adepará nº. 01/2016, available at: https://www.semas.pa.gov.br/2016/10/31/instrucao-normativa-conjunta-no0012016-semasadepara-publicada-no-doe-33241-pagina-41/. Access on: 10 dez. 2016.